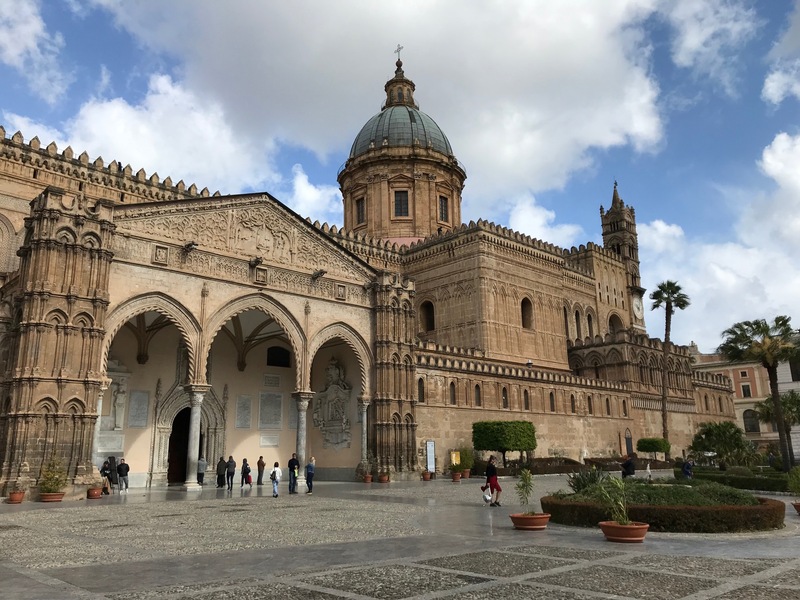 Four hundred year ago Palermo was a very rich city. 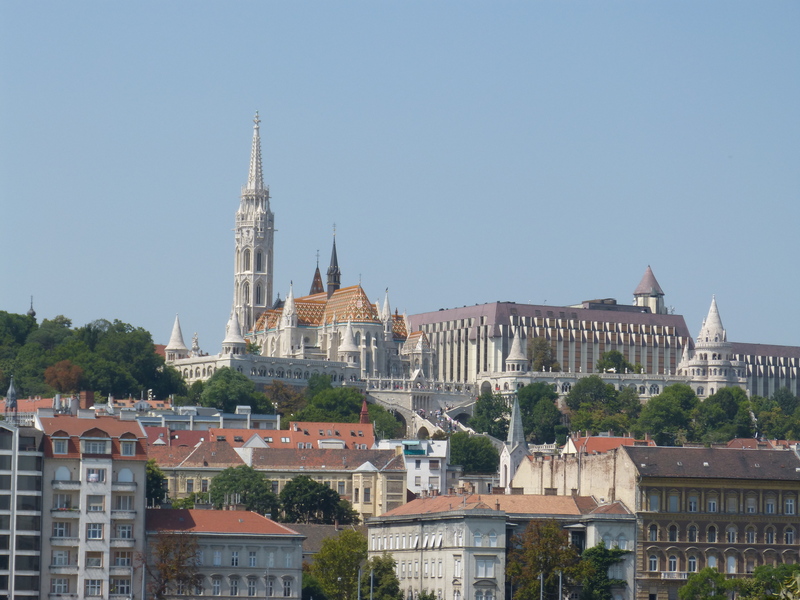 From the 1600s to the 1800s enormous palaces and churches were built to the highest standard here. Relics of that era are found everywhere. 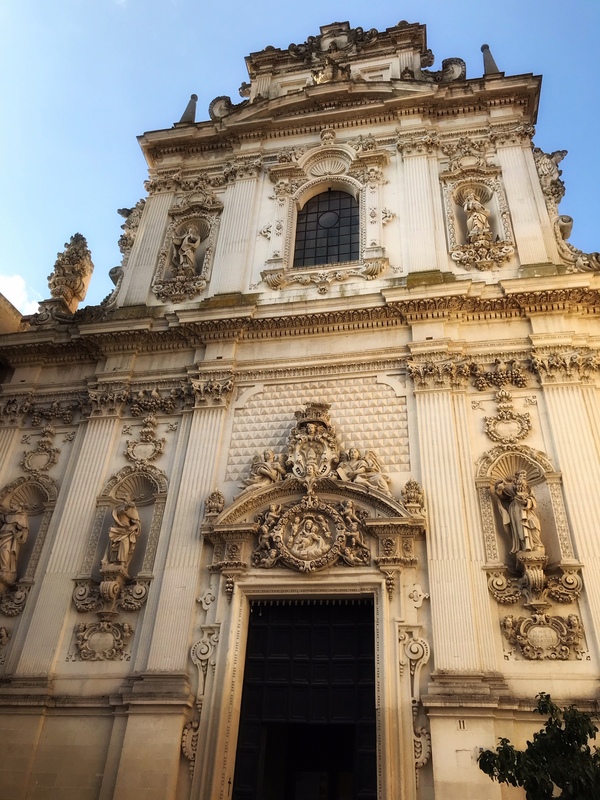 It sometime seems that there’s a baroque church and a rococo palace or two in every block. 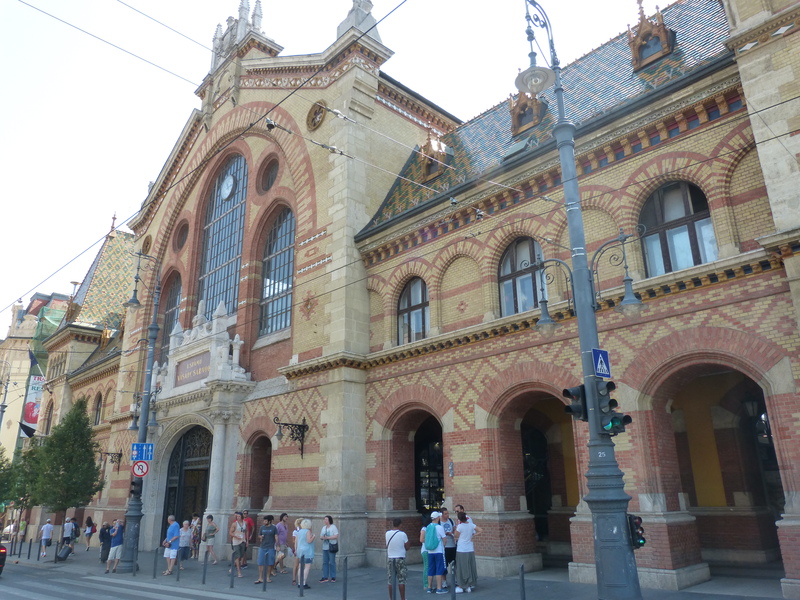 Those huge buildings are often used now as hotels, museums, offices and, more often, apartment buildings. Many of the churches have been re-purposed or closed permanently. This is one a pair of grand portals opening onto a building that’s being restored (apparently). A pizza place is there now but it seems better days are ahead. The many ancient palaces (called “palazzi” in Italian) seem to be faring better than the churches. 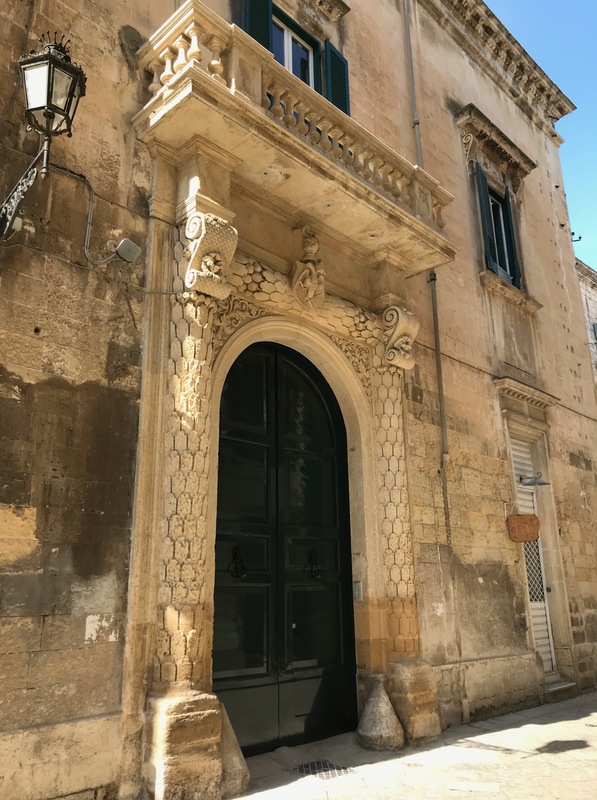 Often the main door to the street is a two-story tall confection of carved stone, sometimes with the coat of arms of the family that built it at the top. Inside the door there’s usually a courtyard open to the sky, often made into a garden with tall palm trees and other Mediterranean plants. 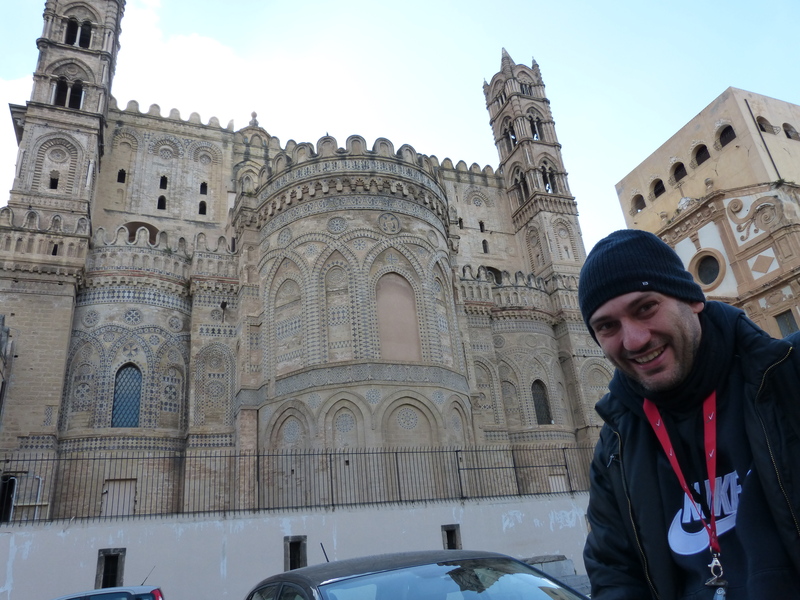 Here’s my new friend Emanuele in front of the eastern end of the Palermo cathedral which I had completely missed seeing. I’ve been fortunate here to have met a very knowledgeable guide, Emanuele DeGaetano. 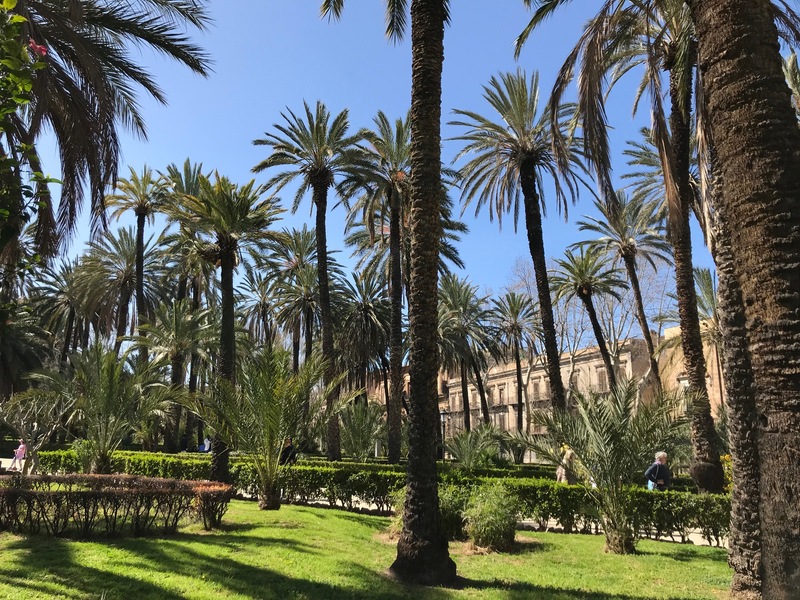 He has introduced me to some most interesting places in Palermo and has shared with me the history of each place. 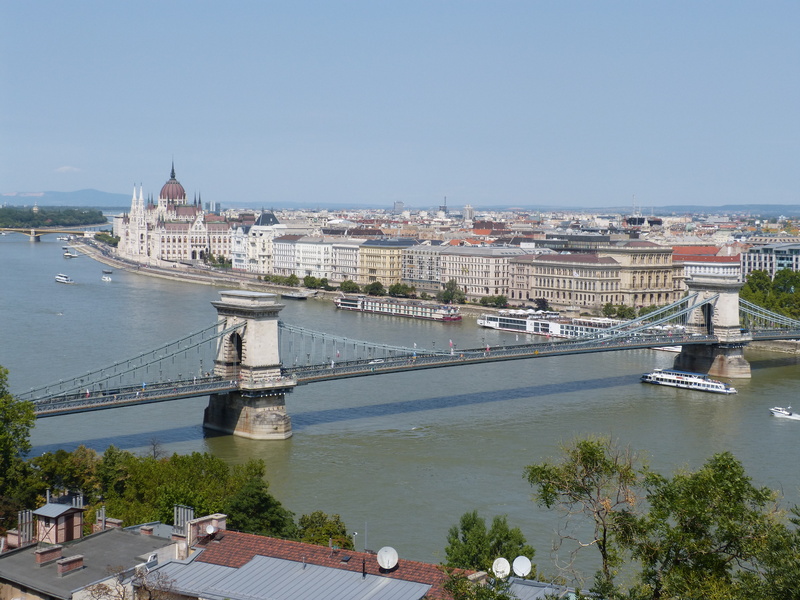 On two occasions we walked for hours, once in the city center and once in the marina district. Emanuele has shown me churches and museums but he’s also shown me giant murals and explained the murders of men who opposed the mafia. He is completely knowledgeable about his city. 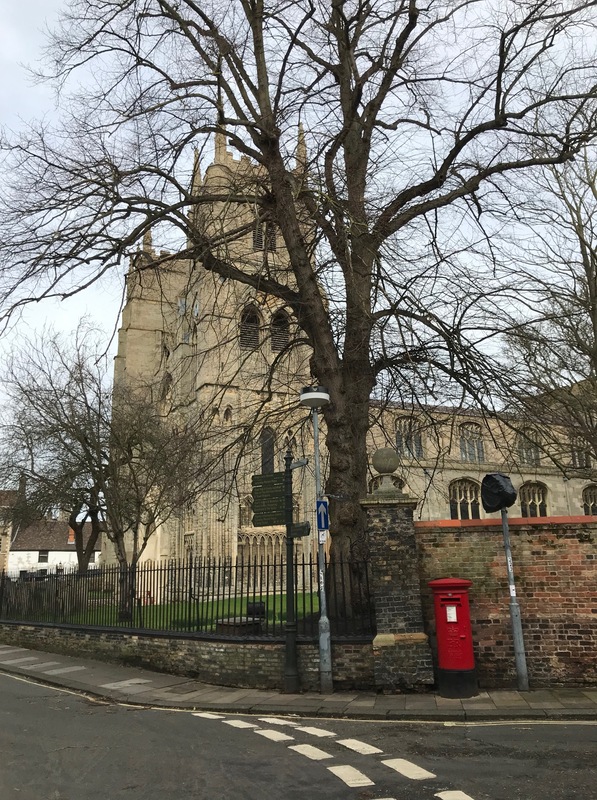 The church tower at the end of this block is wrapped in scaffolding while being repaired. 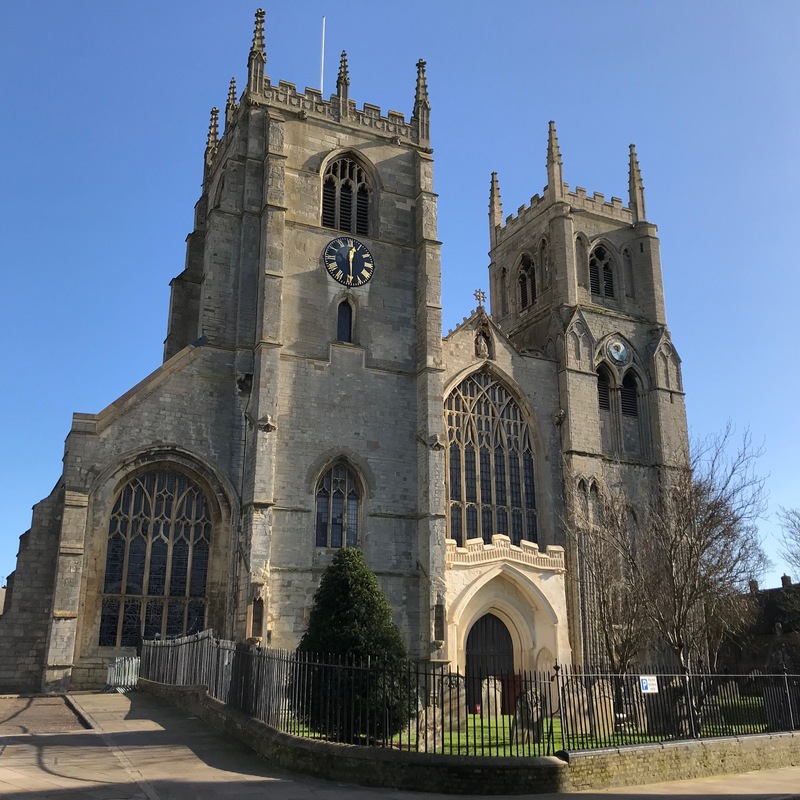 It’s one of two towers and the facade of a huge church that is now being restored. 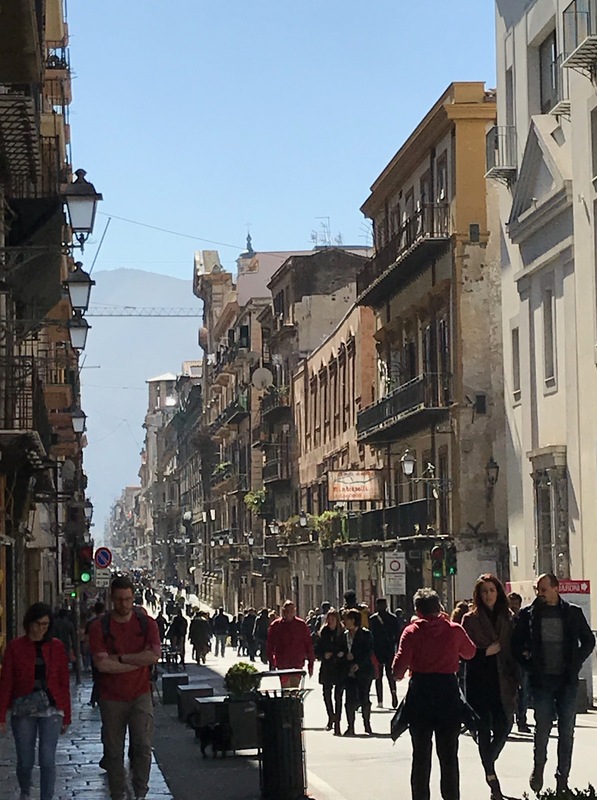 Note the narrow street in the historic center of Palermo and all the balconies. 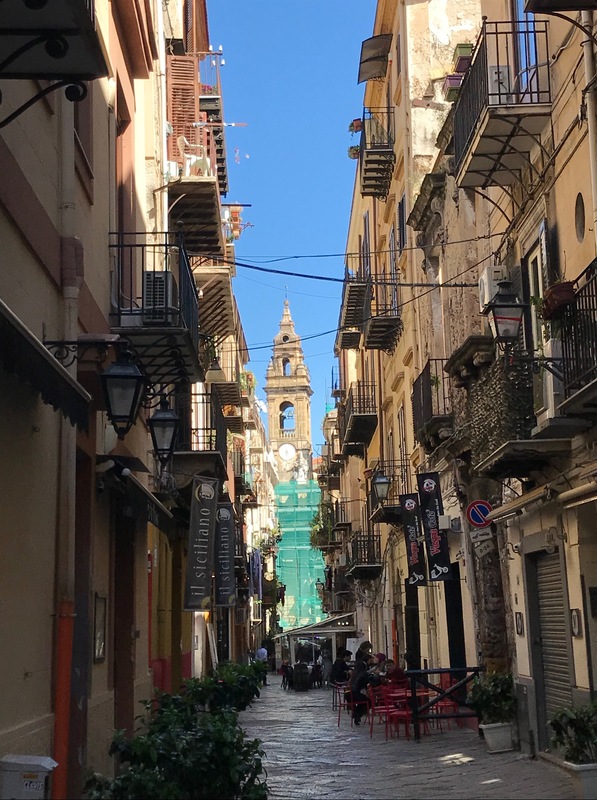 This street is typical of the center of Palermo. 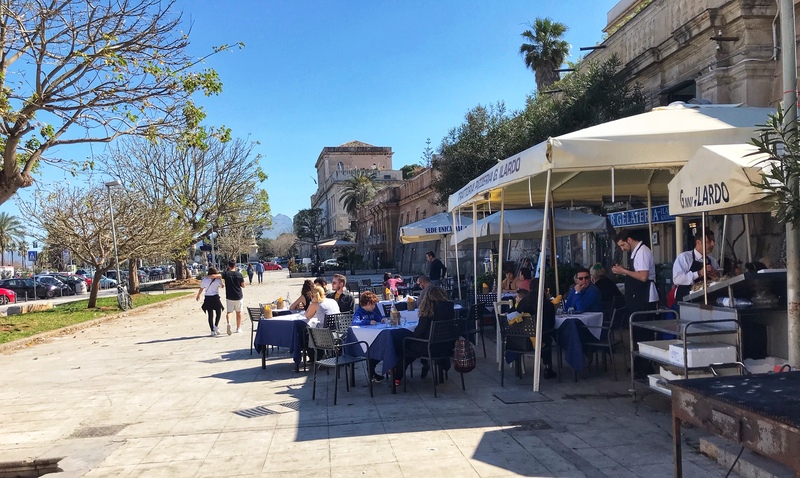 Today Palermo is alive with the energy of young people, with the noise and confusion of a city where everybody seems to be in the street. Swarms of tourists from every part of the world add to the chaos. This is the most alive town I’ve ever been in. People sleep in ancient small apartments in the original city center but they live in the street. Sidewalk cafés are everywhere. Late Sunday afternoon I was surprised when I went to one of the main streets, Via Maqueda, and found it totally packed with people, reminding me of a state fair on opening day. 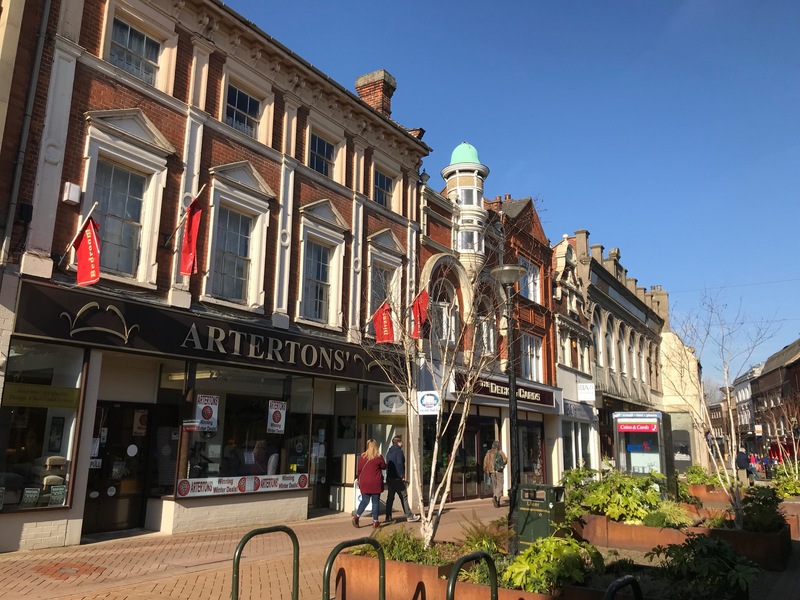 This picture wasn’t taken when the street was packed but it’s the same street, a pedestrian only zone lined with shops and restaurants, all of them locally owned. No McDonald’s or Starbucks here! I’ve been to all the famous cities of Italy (some of them several times) and to other wonderful Italian cities that are less famous. 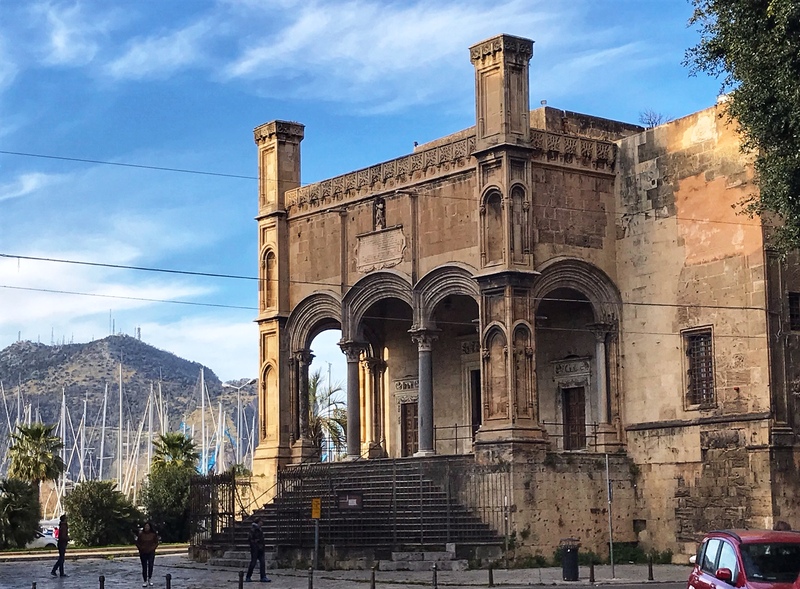 Considering all of them, I’ve found Palermo to be the most fascinating and enjoyable. It is alive! 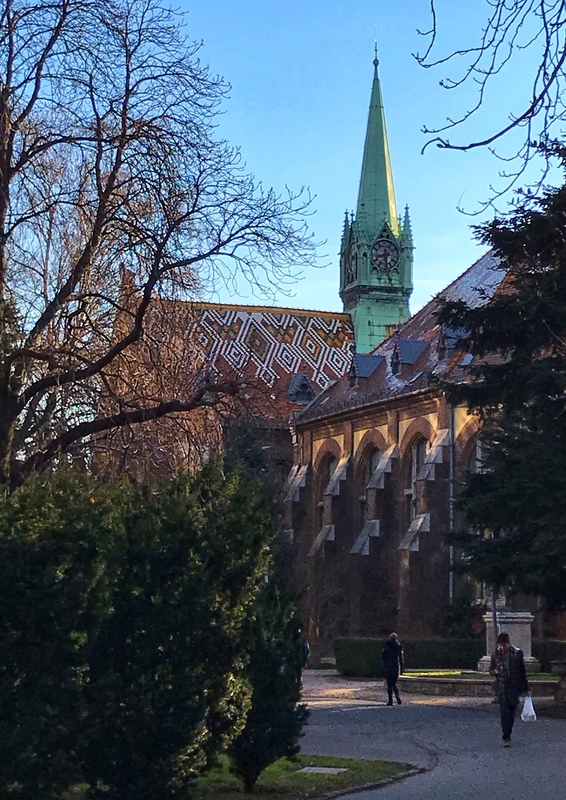 Postscript: March 21, 2019: This morning when I left the place where I stayed this week I found hundreds of young people marching up the main street nearby. When I asked a someone what it was about she said it’s an annual event in which students remember those who have been murdered by the mafia. It happens all over Italy on this day each year.The signs being carried also seemed to express a desire to rid Sicily of the mafia. 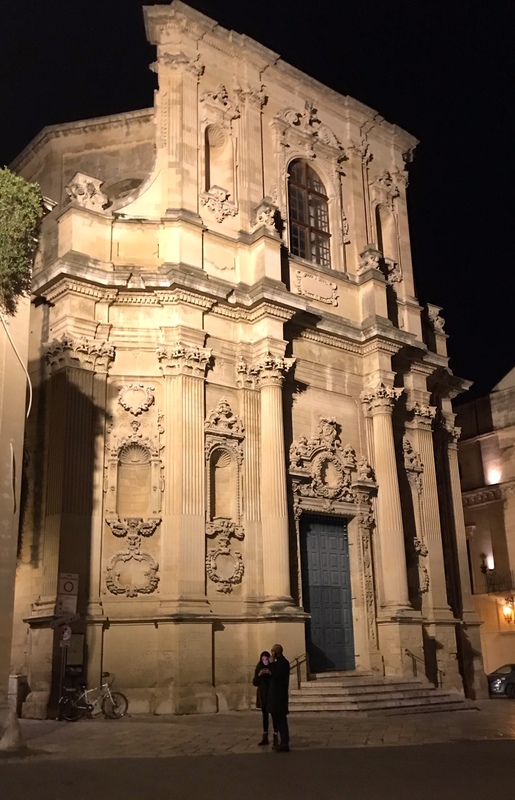 The photo at the top of this post is of one of the very elaborately decorated Baroque churches in Palermo. The dopey little computer I brought on this trip has a terrible monitor. Pictures on it look awful to me. I hope they look better on your screen. Tomorrow I’m off to Siracusa, an ancient Greek city in Sicily. Stay tuned! Catania is Sicily’s second largest city. Home to more than a million people in the metropolitan area, it is located 24 miles from Mount Etna, Europe’s largest active volcano. 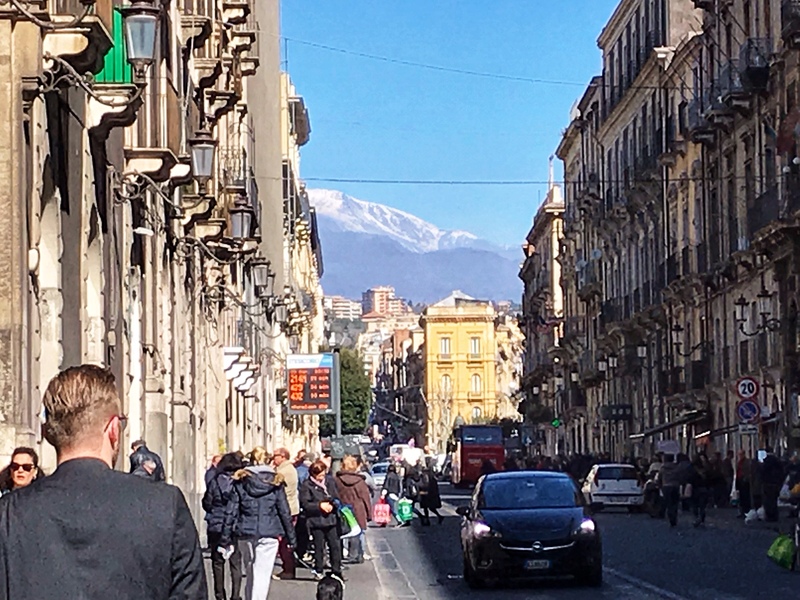 Snowy Mount Etna looms over Catania. Here you see the main street, lined with 18th century buildings and leading directly to the volcano which is still very active. I stayed just two blocks from the yellow building in the background of this picture. The city was destroyed by an eruption of Etna in 1669 and by an earthquake in 1693. 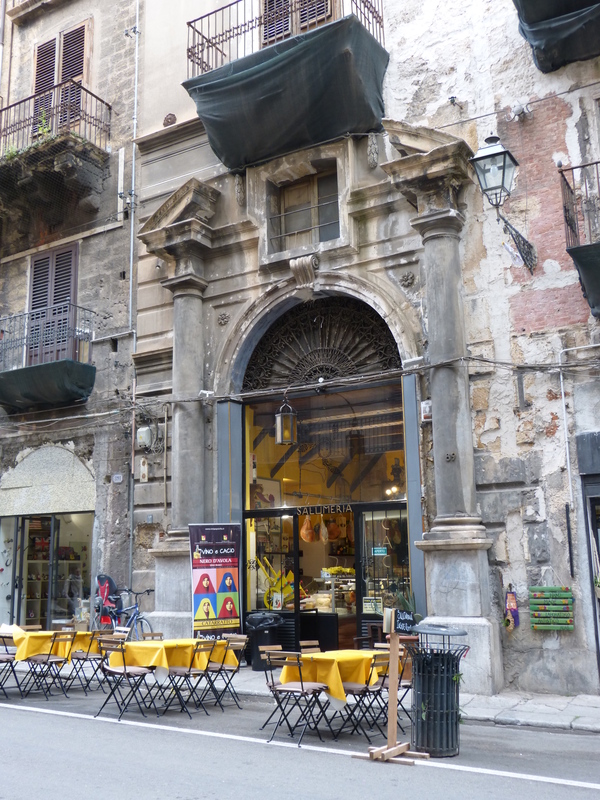 Little remains of pre-1700 Catania. I have read that one-third of the city population died. There was so much lava that the city’s port was partially filled and the city’s area became much larger. 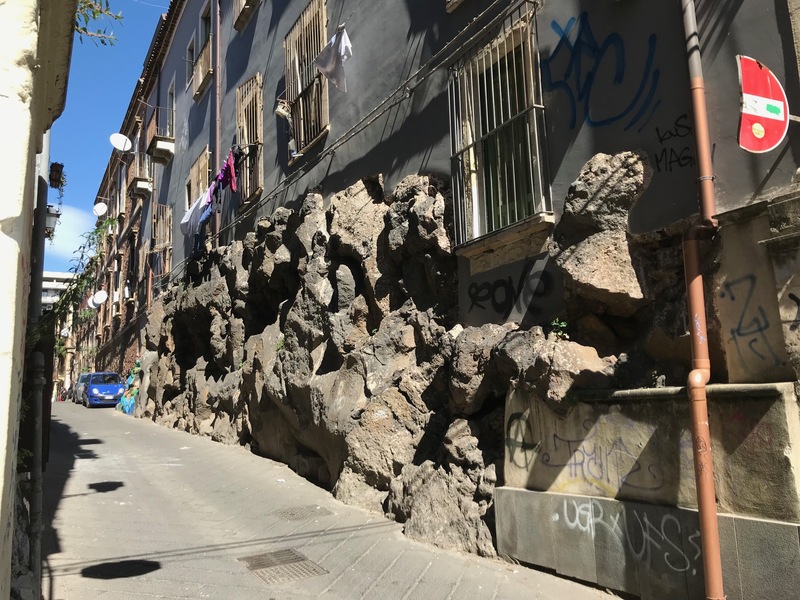 Much of Catania is built on the lava rock that was left in the late 1600s, The owners of this large building just left it there and built on top of it several centuries ago. Today much of the city is comprised of large buildings lining the streets densely, most of them dating from the 18th century. Grand palaces are scattered throughout the city but today many of them are broken up into small apartments where laundry flies from the windows. Catania seemed to me to be smaller Naples. 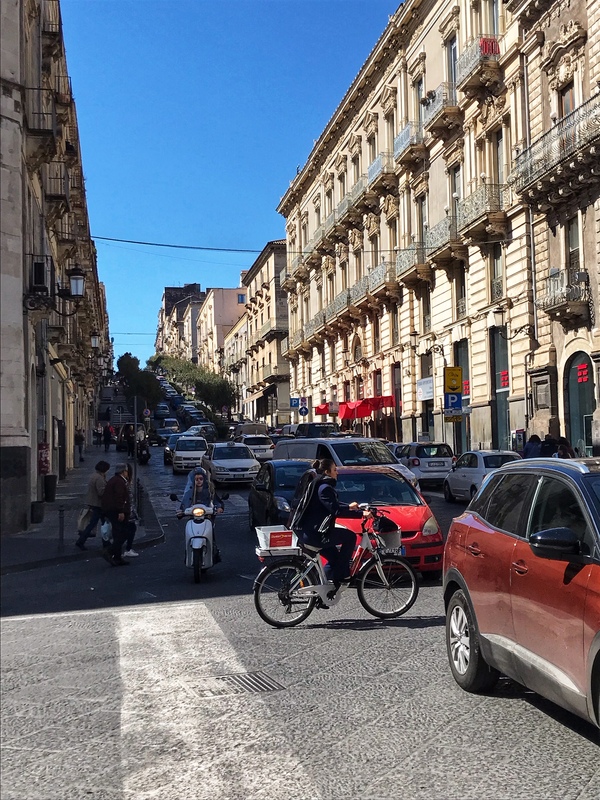 Like Napoli, there are no traffic lights in the busiest area of the city. I thought I was going to die in the taxi that took me from the railroad station to my apartment. 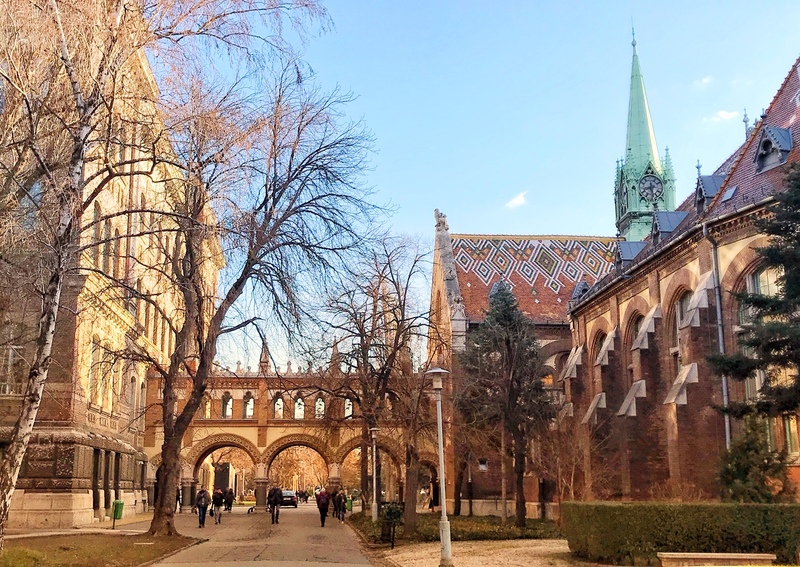 Beautiful old churches seem to be found in nearly every block. I thought this one was especially fine. Can you spot the angel? Crossing streets is really a challenge! 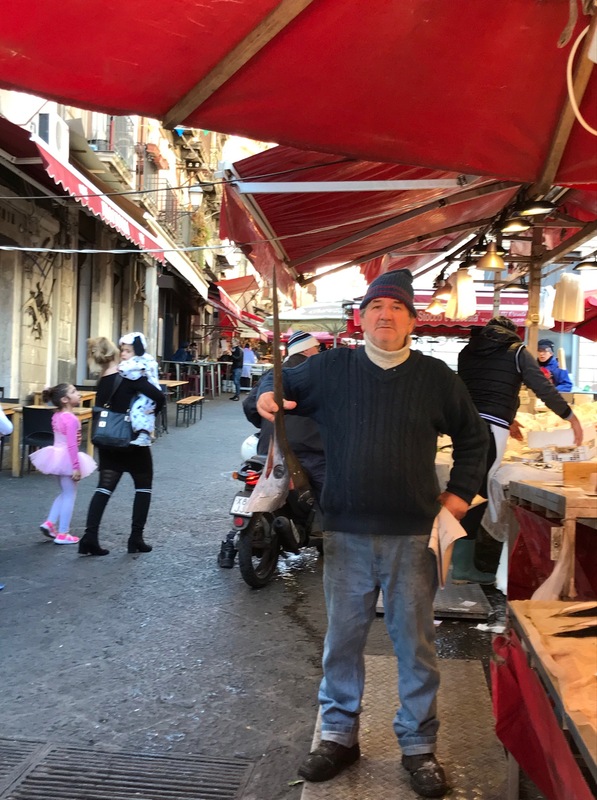 Catania has two famous market areas: the fish market located just outside the cathedral where I found the man with the swordfish head shown at the top of this post, and a larger market that stretches through the center of the city beginning within a couple of blocks of my AirBnB rental. 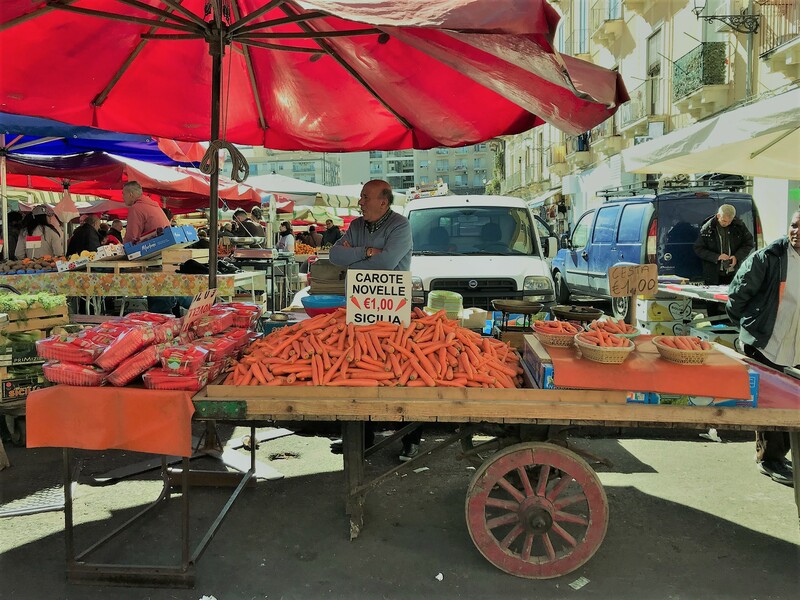 That one not only sells food of all kinds but also shoes and clothing, household gadgets – just about anything you can imagine. If you’ve followed this blog for a while you know I love taking photographs of markets. 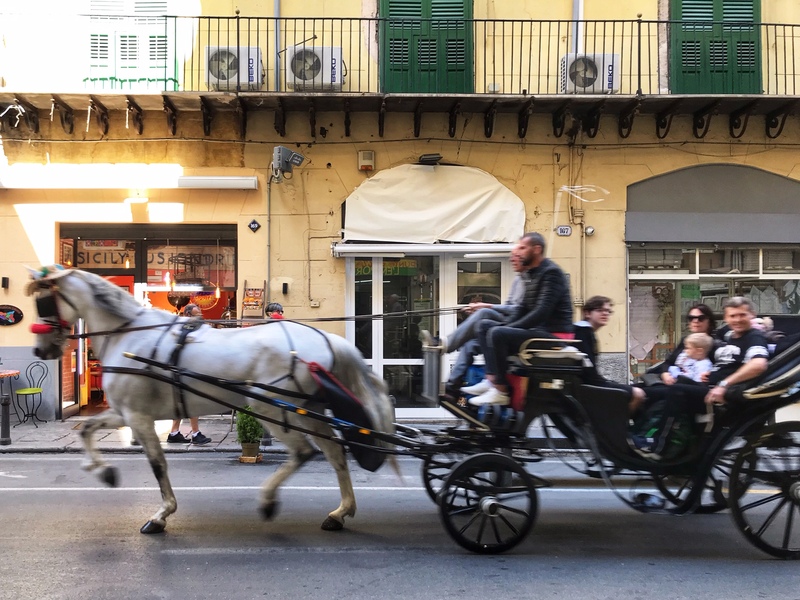 Here’s some of my favorites from Catania. 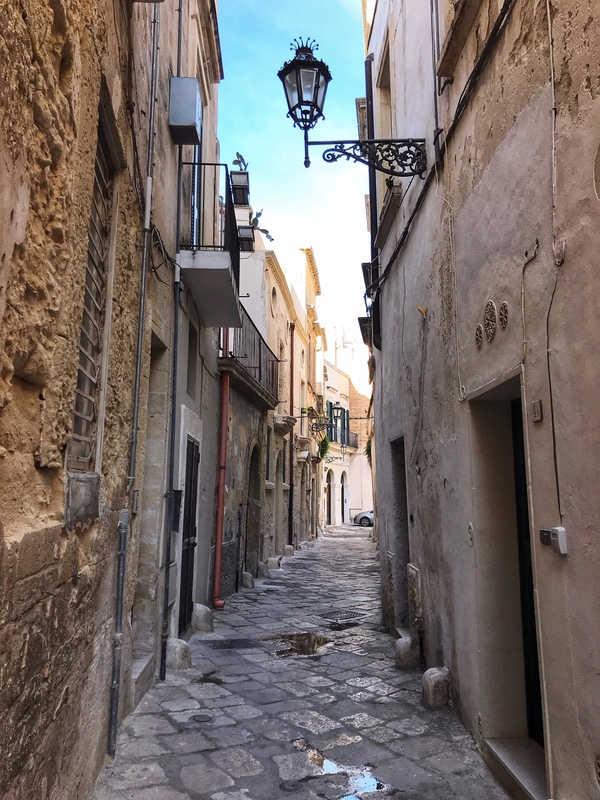 Wandering the narrow streets of Lecce (and always getting lost) over several days was one of the best travel experiences I’ve had. 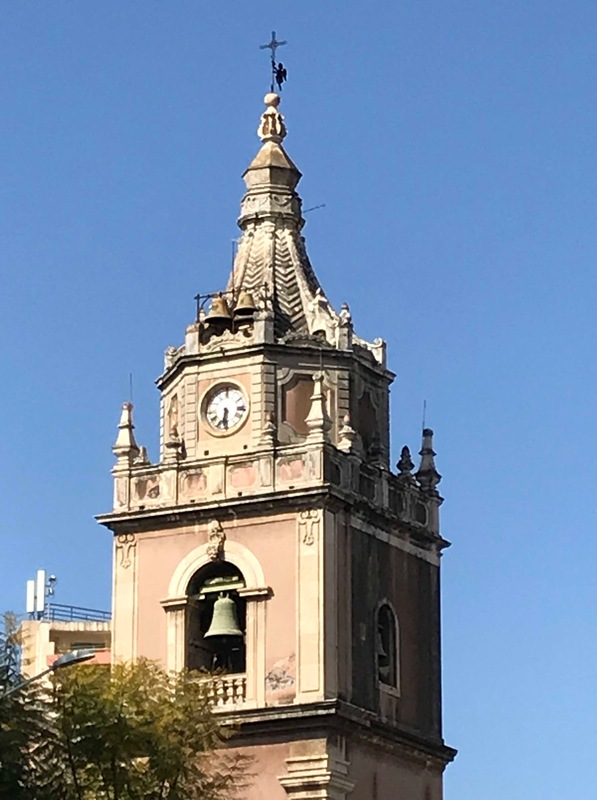 Although the city has a population of about 100,000 and a very active and successful business community, the ancient city at the center is protected, authentic, delightful. 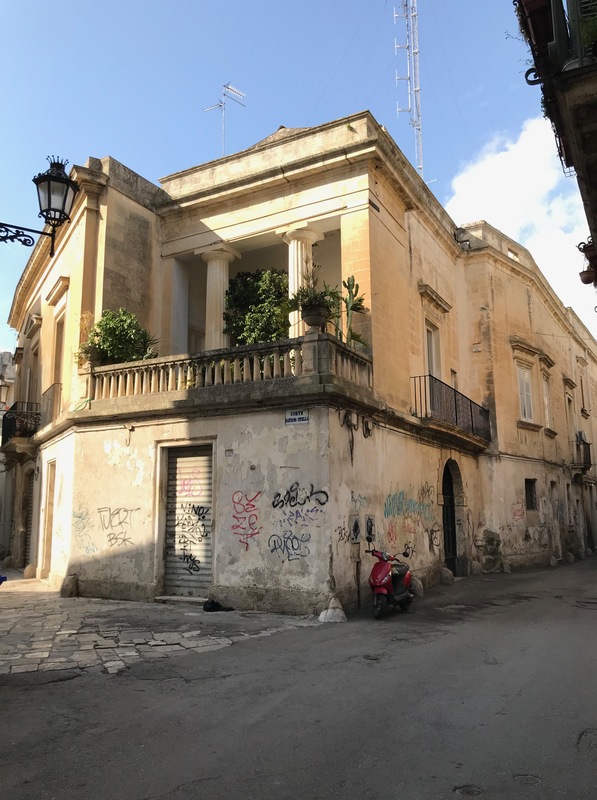 I thought it might be fun for you to read about and see some of the bits of Lecce that made it very special. On my first night in town, taking a walk without any idea where I was going or how to find my way back… stumbled upon the remains of the Roman amphitheater. 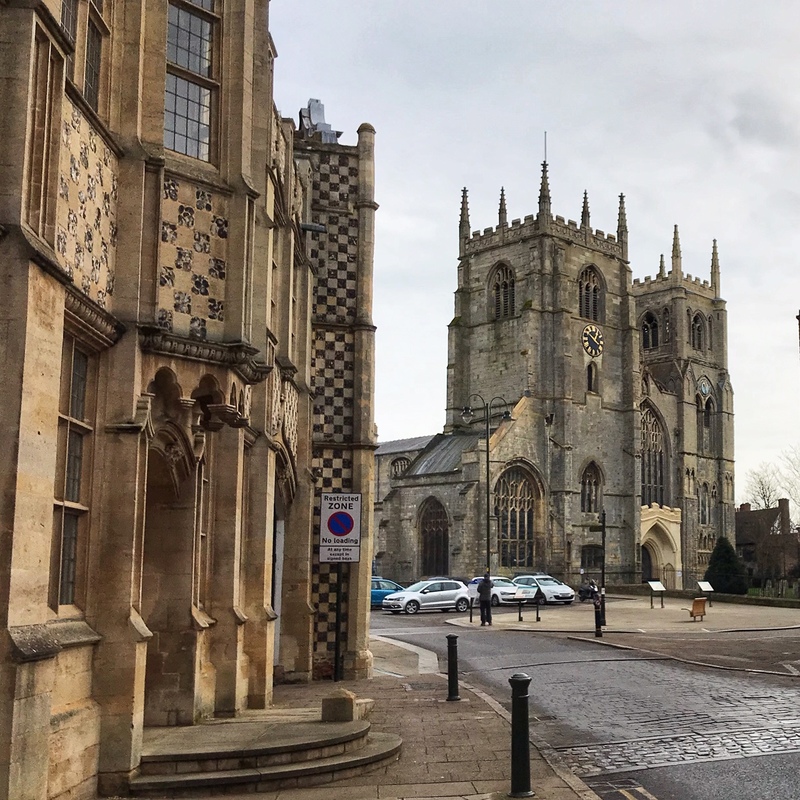 Just behind it was a recently restored 14th century building that’s served as the center of town forever. 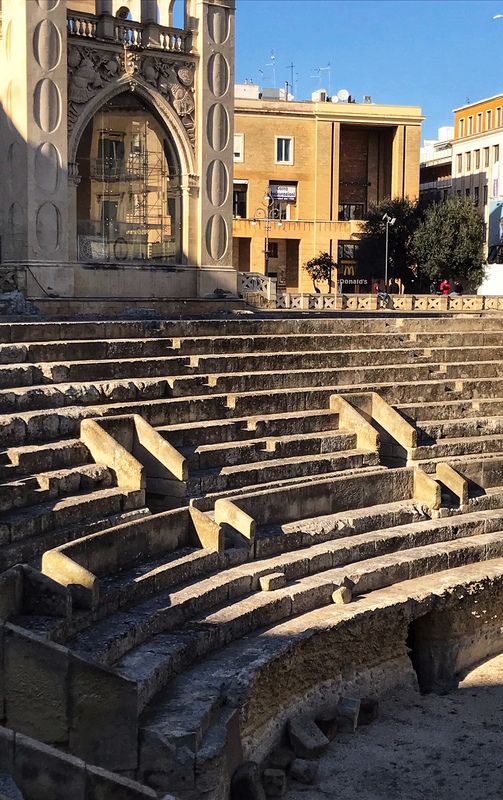 The next day I found the stage and remaining seats of the Roman’s theatre. Everywhere I found late renaissance churches and palaces and ordinary homes. 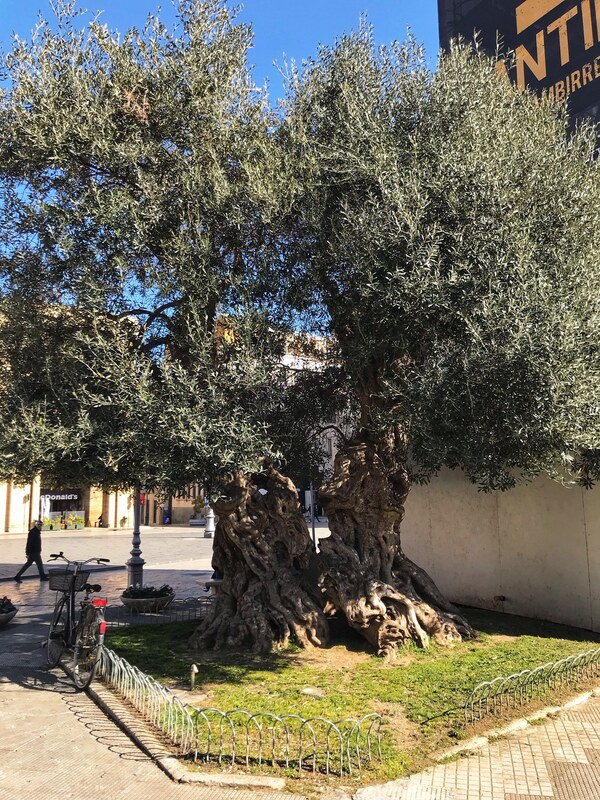 A block from the theatre stand the pair of ancient olive trees I shown above. I wonder if the Roman’s planted them? I think I slept in a renaissance barn. It was all enchanting. Some of the extant Roman coliseum with the 13th century building at the upper left. Hidden somewhere in this picture is the symbol of a famous 20th century American institution. Can you find it? No matter how hard I tried, how much attention I paid, how much a planned ahead, how many maps I used, I got lost every day at least once. This is a really small area! I got the most lost on the last morning lugging my bags to the train station. I had been there at least three times but I got so twisted up near my apartment! 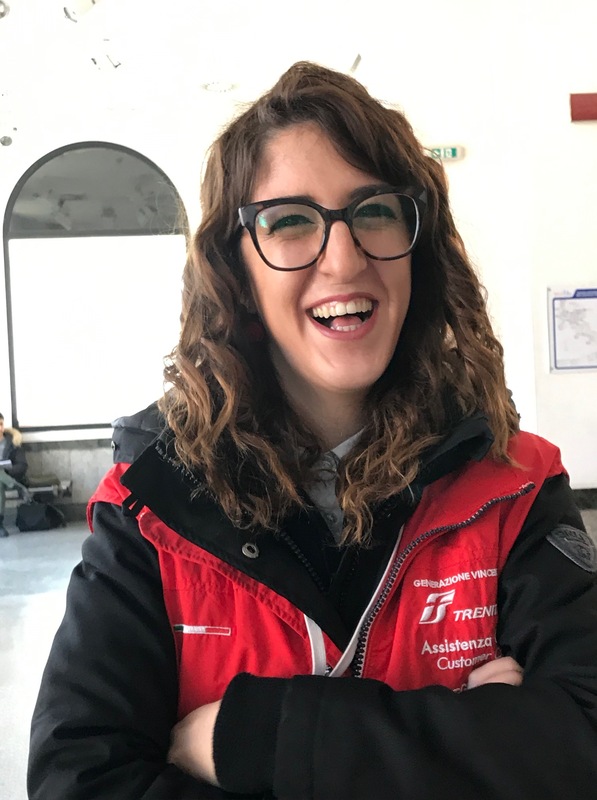 I came upon a group of men chatting on a Sunday morning and asked “which way to the stazione?” Two of them immediately disengaged from their friends and began leading me to the station, taking my luggage in hand. On the way there one of them had to head off in another direction but the other stayed with me all the way. He was so nice, dragging my stuff, testing his English with me. I have found the young people everywhere I’ve gone in Italy to be very good to old ladies! This lovely young woman allowed me to take her picture because I told her she looks like someone I know. As reported in my last post, the soft stone of Lecce is said to be easy to carve. Saints and angels peer down at pedestrians all over town. The palaces (palazzi) have lushly carved window and door surrounds but my favorite thing about them were the balconies outside every window. Balconies held up for centuries by carved heads and shoulders of men and women and animals. An example of frequently seen carvings holding up an 18th century balcony. Another tradition in Lecce is papier maché. Our guide pointed out to us in one 17th century church that the ceiling was entirely made of the original papier maché. But the most fun use of it appears as small souvenirs for tourists to take home and small street sculptures. Here’s one example. 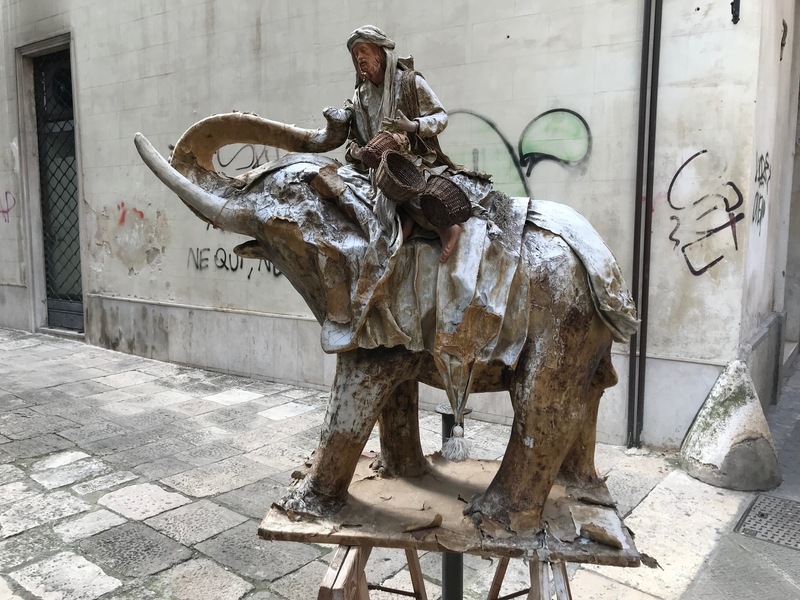 A very old elephant made of papier mache and his rider. Of course food! Good homemade (bakery and restaurant made) traditional food. Every day begins with a “cornetto” – a croissant filled with vanilla custard or Nutella or something equally good and a tiny cup of espresso used to transport several teaspoons of sugar into a body. Cheese: I ordered a caprese salad and got an entire mozzarella the size of a baseball. Pizza everywhere! Naples style. Pasta with an unending variety of toppings. Sandwiches and salads topped with ham, usually thin slices of prosciutto. My favorite restaurant was called Nonna Tetti (correct me if I’m wrong but I believe “nonna” means grandmother). 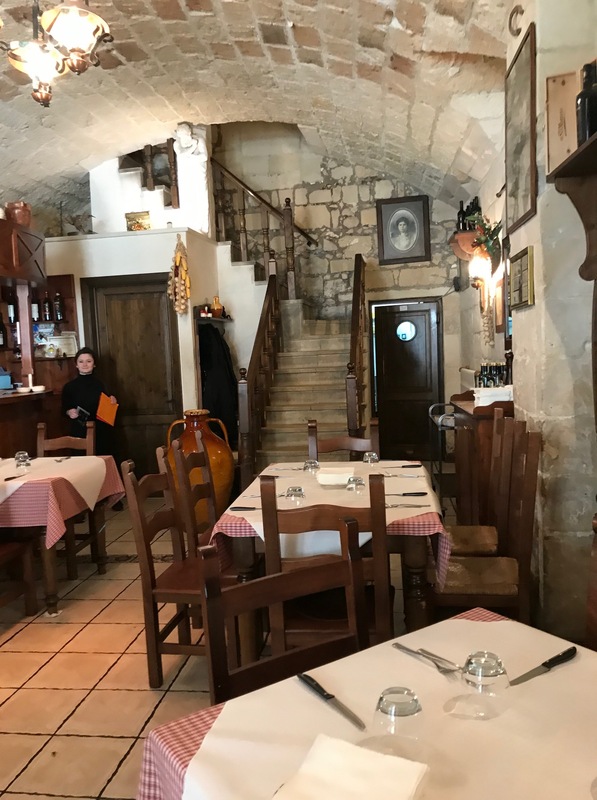 A charming small trattoria with a varied menu and low prices. 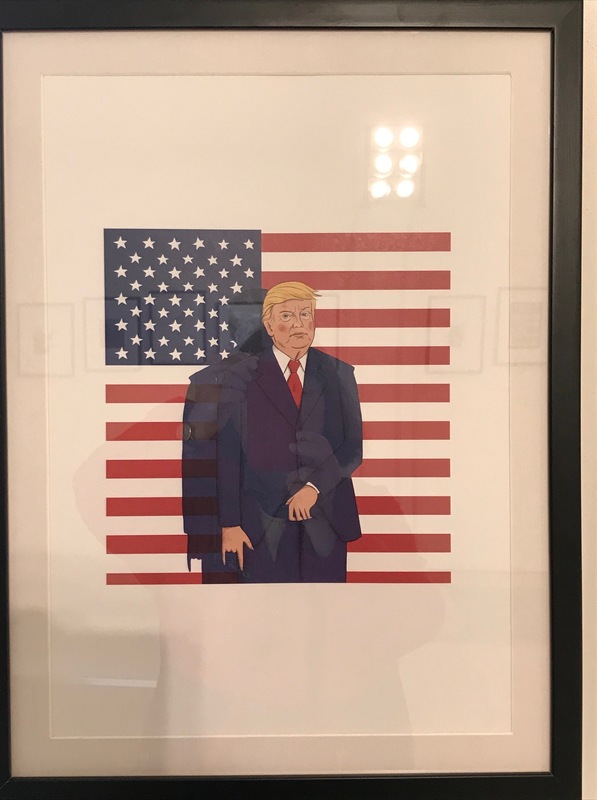 I must share with my friends this work of art I found in the town’s modern art museum. This man has few admirers in Europe. I’m told the two-finger salute is the Italian version of the American one-finger salute! 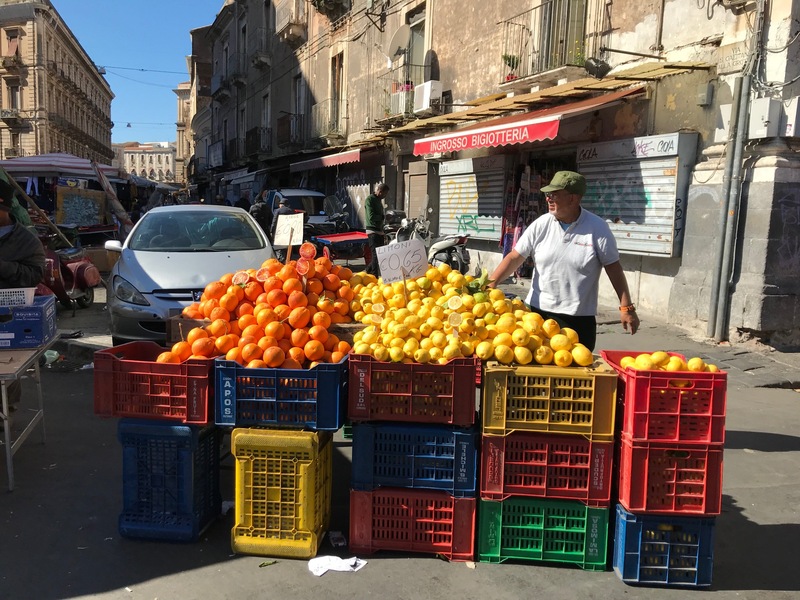 Next: surprising Catania! Come back soon. In the Heel of the Boot! If you look at a map of Italy you will see that it’s shaped like a high-heeled boot. 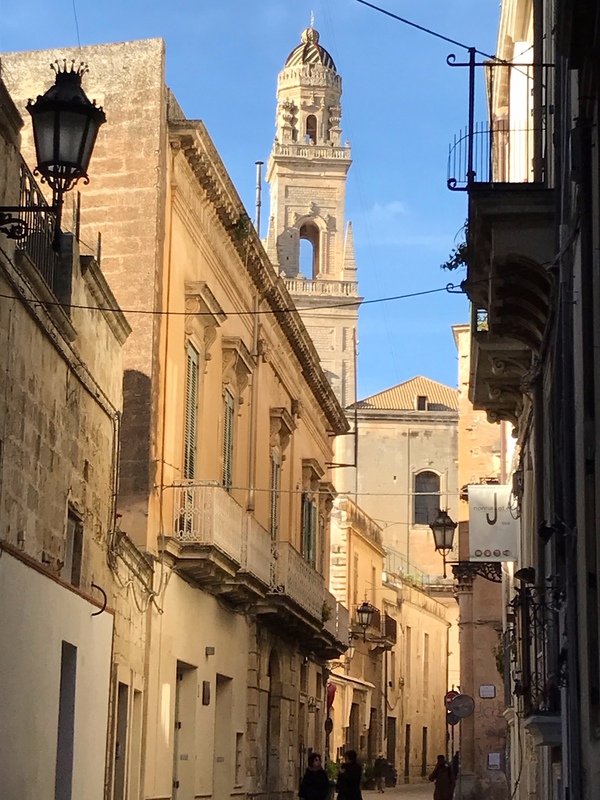 This week I’ve been in Lecce, an ancient city in the center of the heel. There was an organized society living here 4000 years before the Romans came. The Appian Way, the most famous Roman road, ended here. 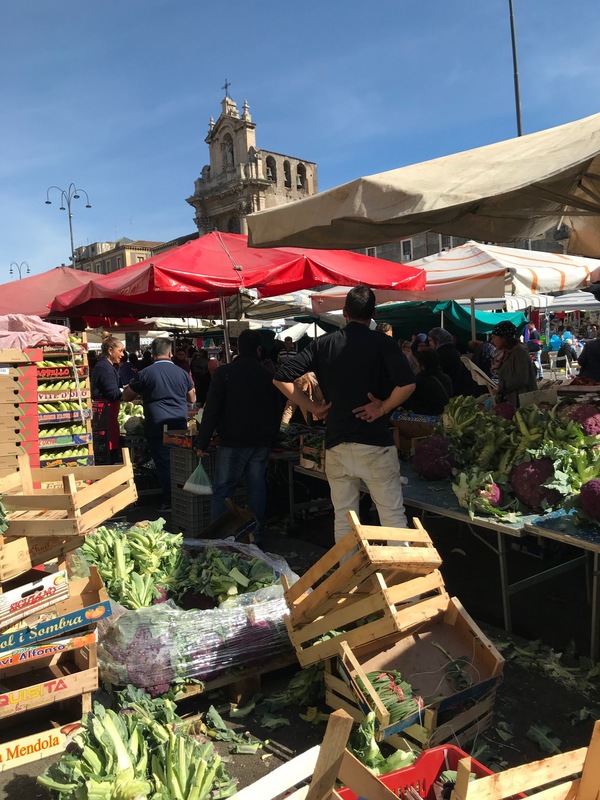 In the next 1000 years or so following the demise of Rome a highly successful agricultural economy based on olive oil and wine developed here with Lecce the financial capitol. Some of the merchants and financiers became extraordinarily wealthy. 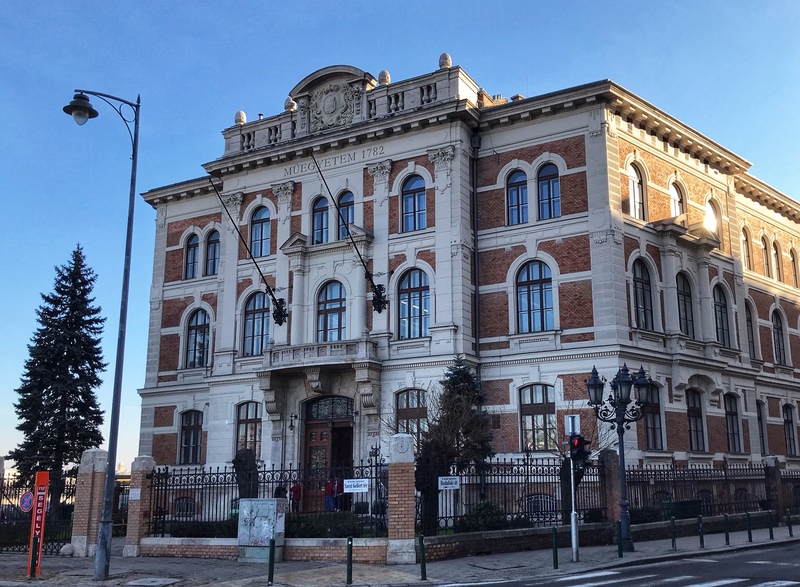 They built massive, ornate homes that continue to exist today. 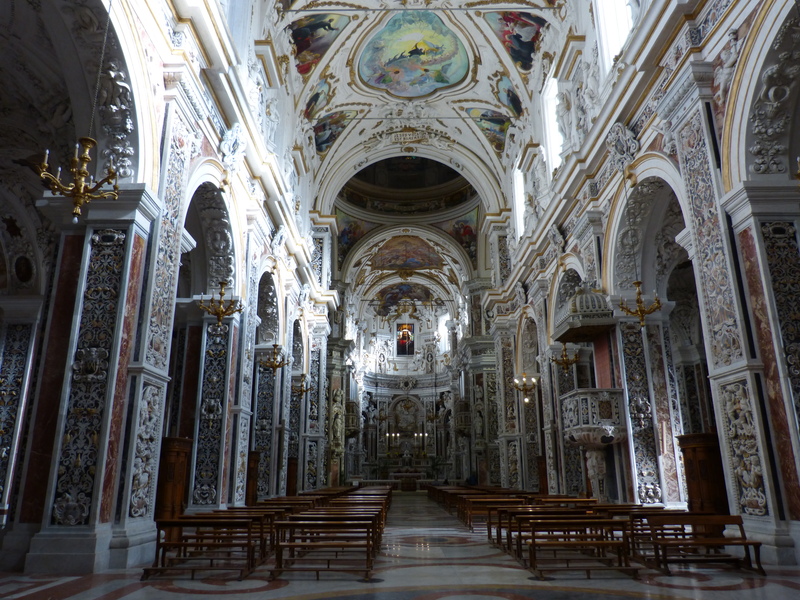 They financed the building of a great many baroque and rococo churches. 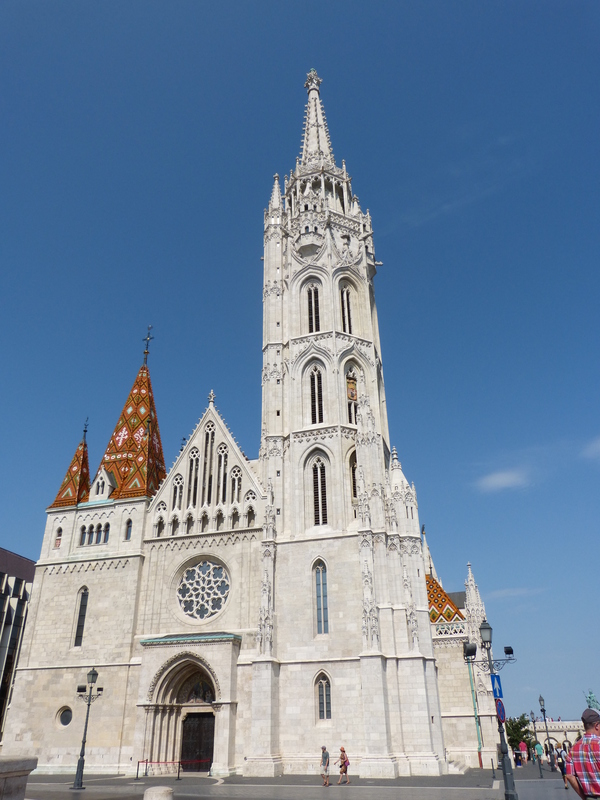 Here’s another example of an ornate church. The map I’ve been using lists 25 churches like this within the old town walls. My guess is that the town is about 1 mile on each side. 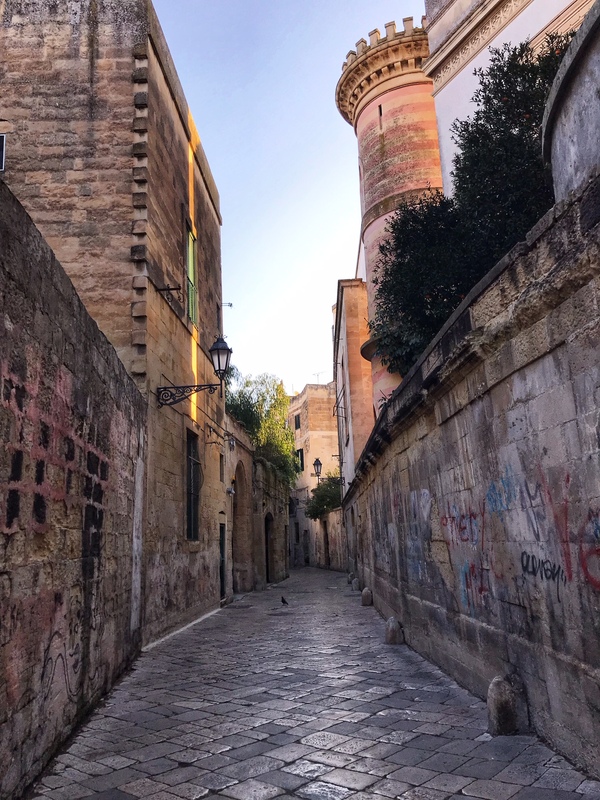 An early evening view of the street behind one of the most decorative palaces — in pink and white stripes and with a tower. This doorway surround is typical of many found on the old palaces. Huge doors insured the privacy of the inhabitants. This town is a mixture of ancient beauty and the 21st century ugliness. Here’s the street my tiny apartment is on. Too narrow for automobiles but ok for bikes. It’s quiet. 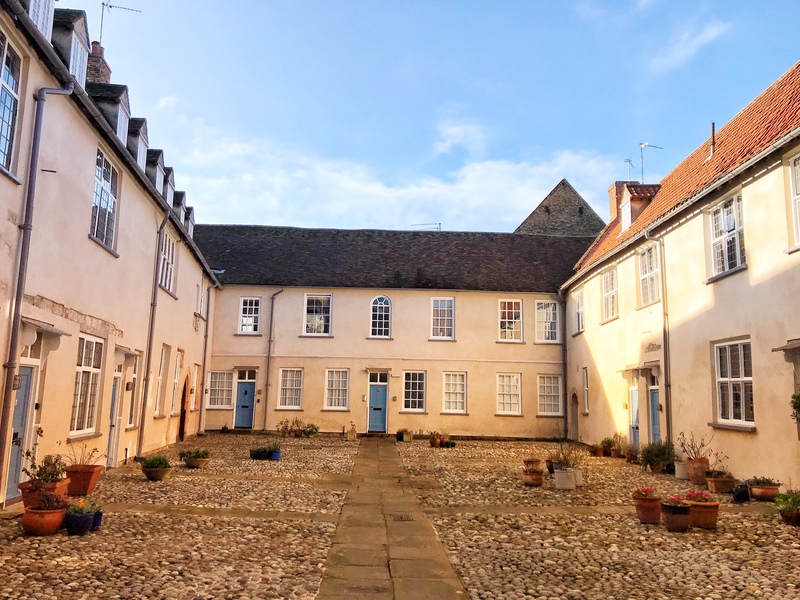 The beautiful home in which I’m staying is situated in a building constructed in the 1600s as an addition to a large place built as a medieval home and warehouse around 1350 and added onto in the 1420s. 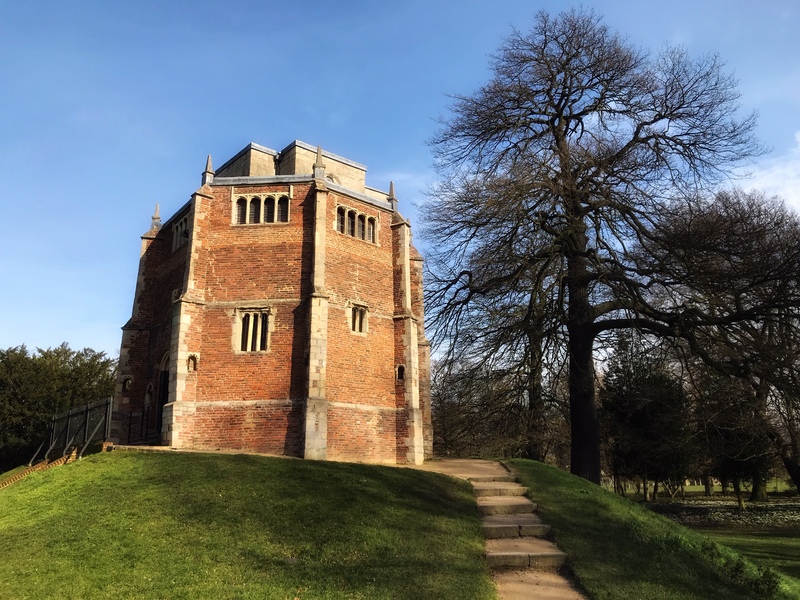 Located on the river’s edge, it was one of the most important buildings in the town. As recently as the 1930s it was a disaster. 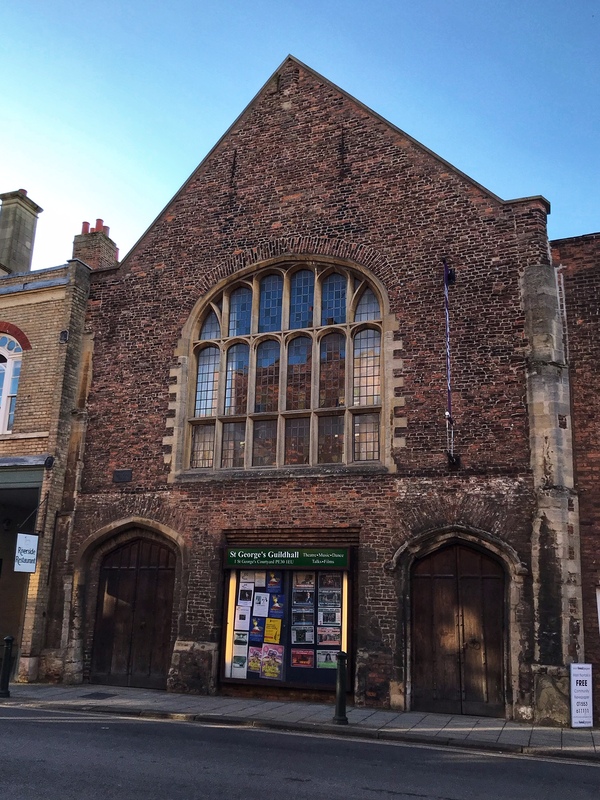 In the mid-20th century some people in the town of King’s Lynn organized a trust and raised funds to rescue this property and one other. Now it houses 15 townhouses. One of them is owned by Helen, a gracious and charming lady who is hosting me for two weeks. Lucky me! 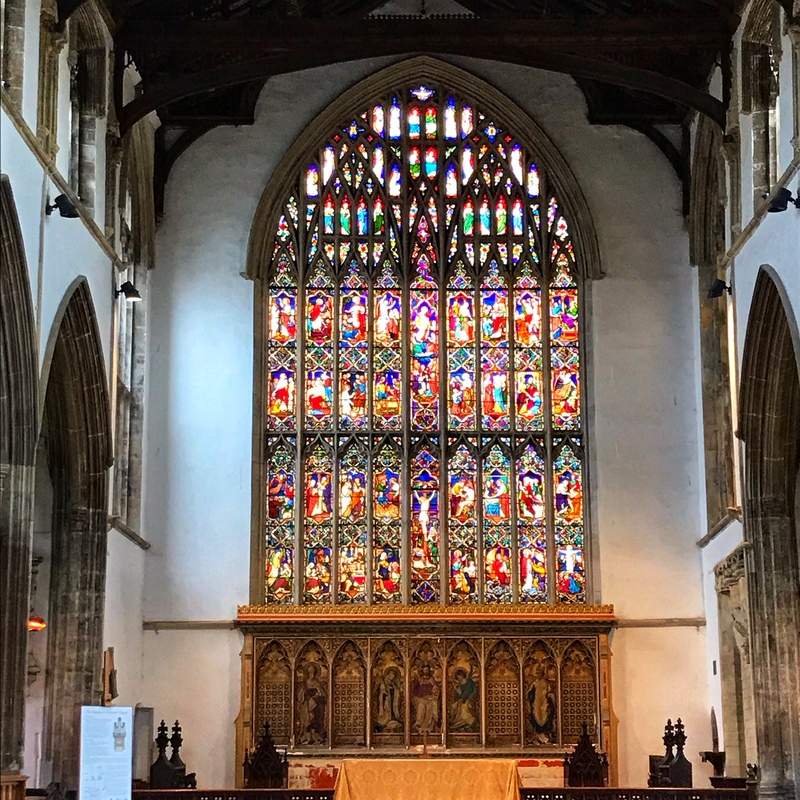 Each time I walk out the door I see a magnificent church built in the 12th century. Next to it a small row of brick cottages, originally part of a priory (monastery) from about 1100 AD. 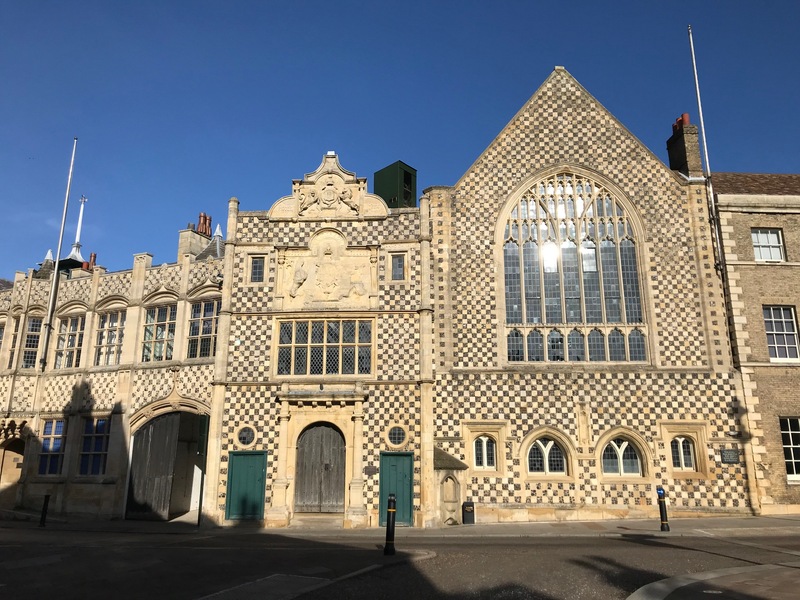 I see the spectacular city hall built in the 1400s. 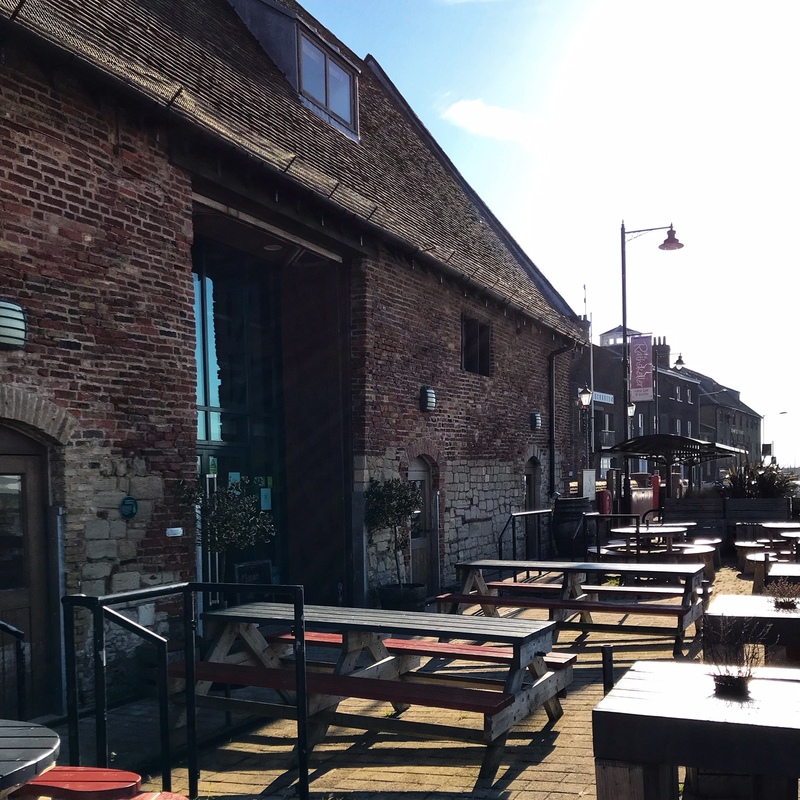 Next door is a warehouse built by the Hanseatic League in medieval times. 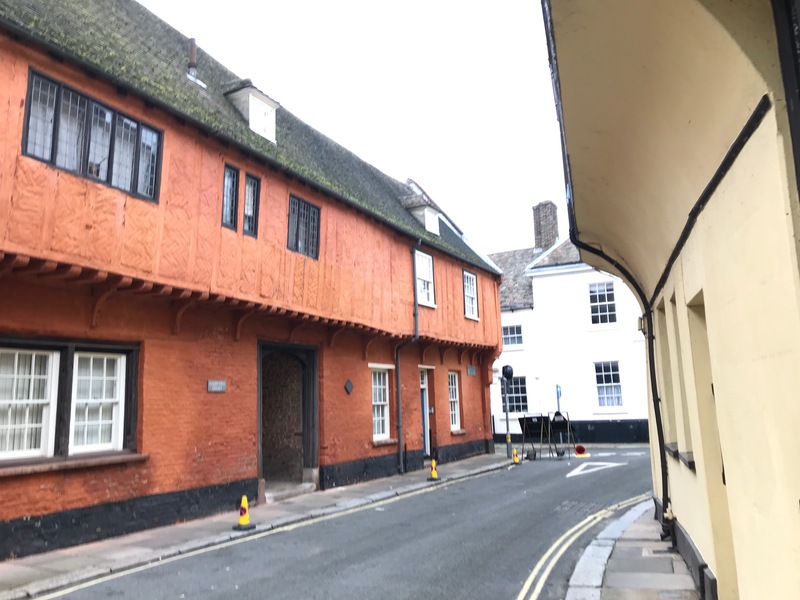 Nelson Street, on which this house is placed, is lined for its entire length by medieval and renaissance era homes. I love being here! Thank you AirBnB! 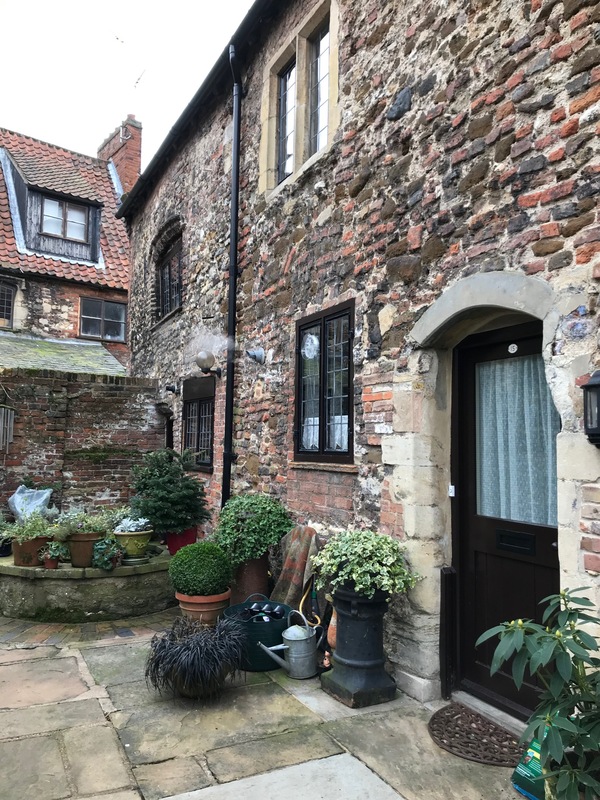 Please come out with me now, on a walk out of my medieval home in King’s Lynn. This big orange building is Hampton Court. The house across the street is from the medieval period. Here’s the entrance to Hampton Court. 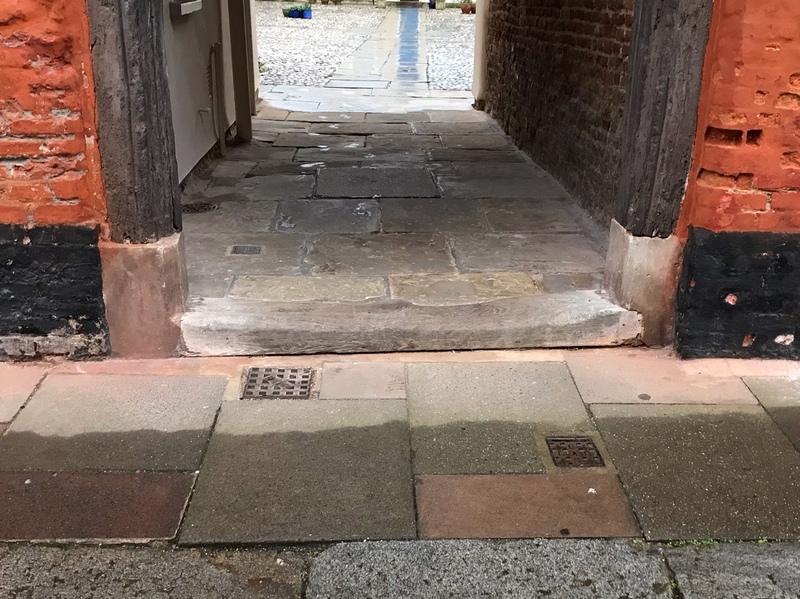 Notice how the oak threshold has been worn away over the ages. 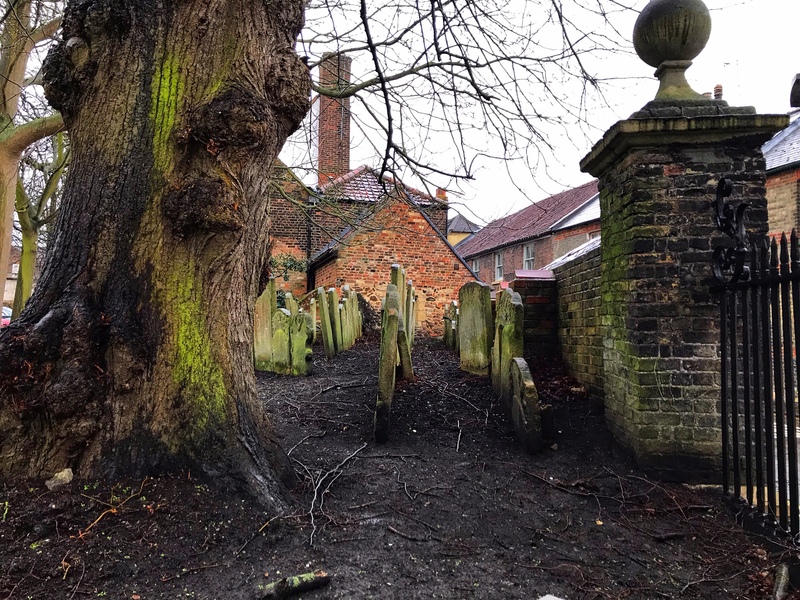 The black posts on either side are also oak, but they feel petrified: hard as stone. 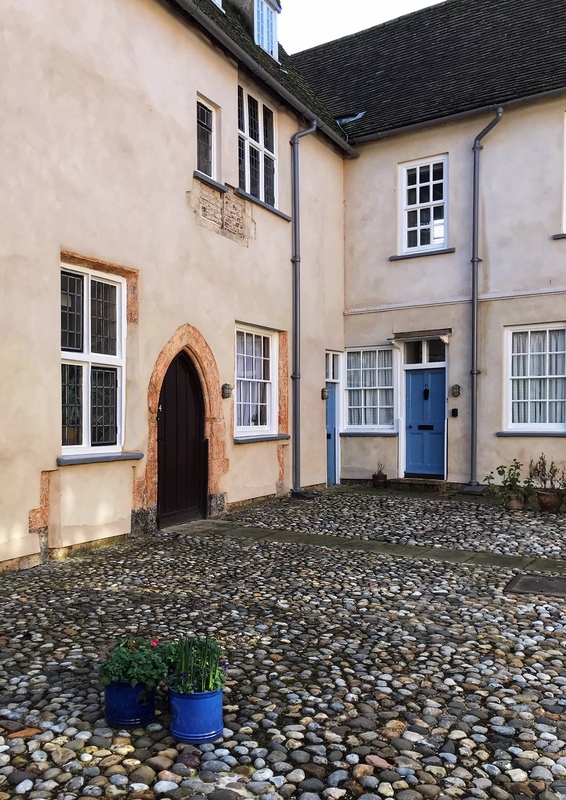 The arched doorway on the left is the entrance to the part of the house built about 1320. 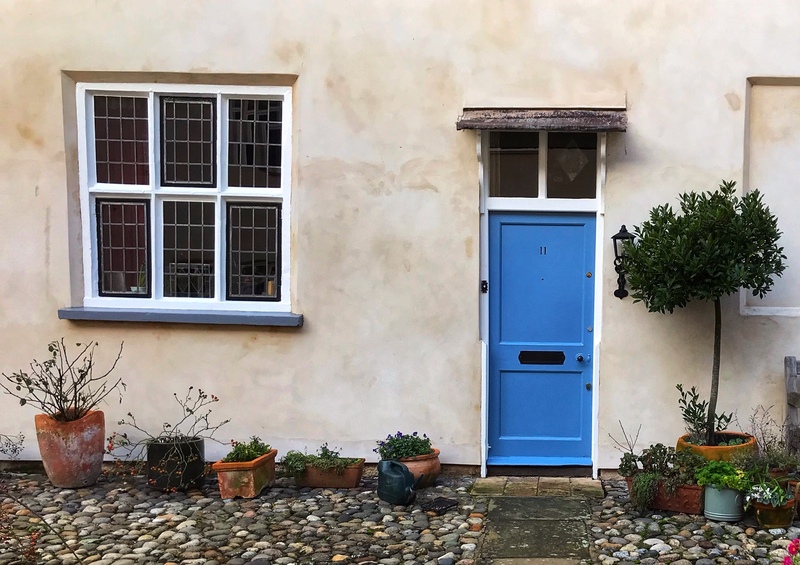 Here’s “my” door, with spring bulbs and primroses blooming in pots by the door in February. When I walk out this is the first sight I see. 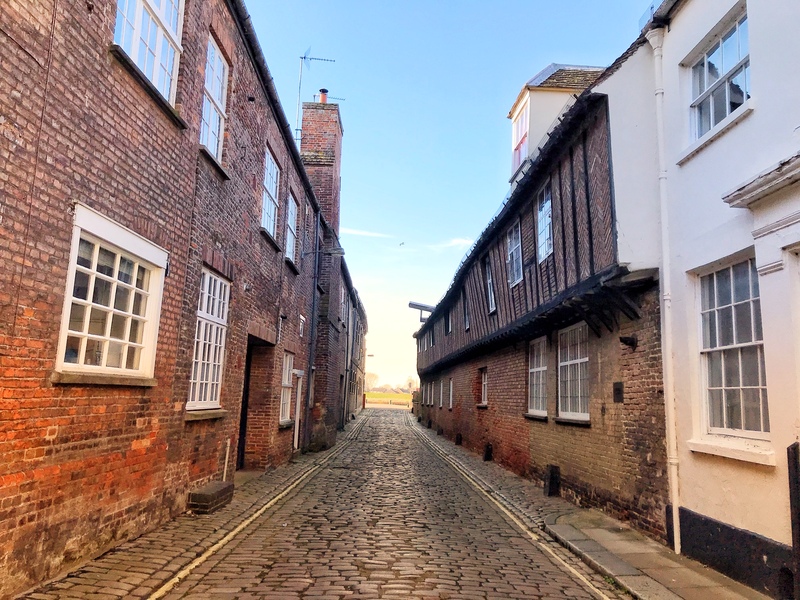 This old cobblestone street runs between Helen’s kitchen on the left, and a warehouse built by the Hanseatic League in the 1400s. This is the backside of the priory cottages built in the early 12th century. Notice all the different patches of brick and stone used as the buildings have been patched and changed. The owners maintain container gardens in the small space between their cottages and the church. 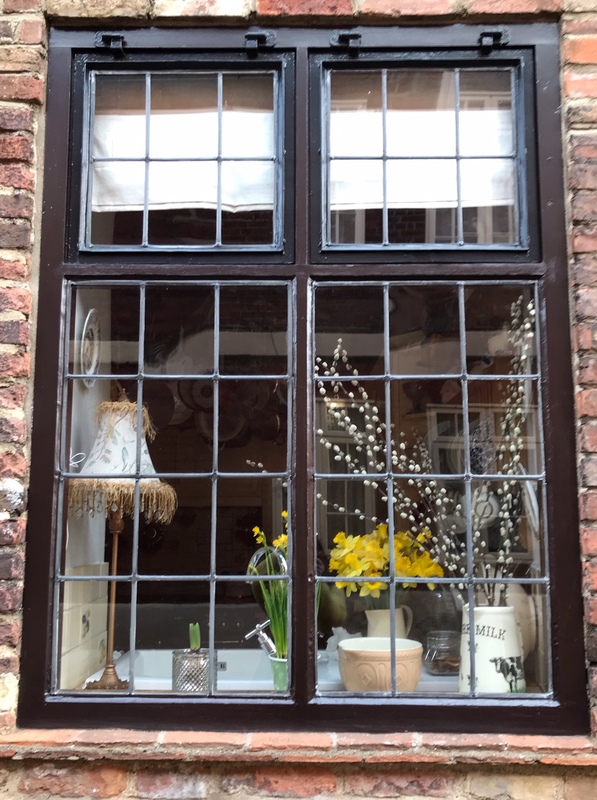 I can’t resist including this photo of a spring time window in one of the priory cottages. 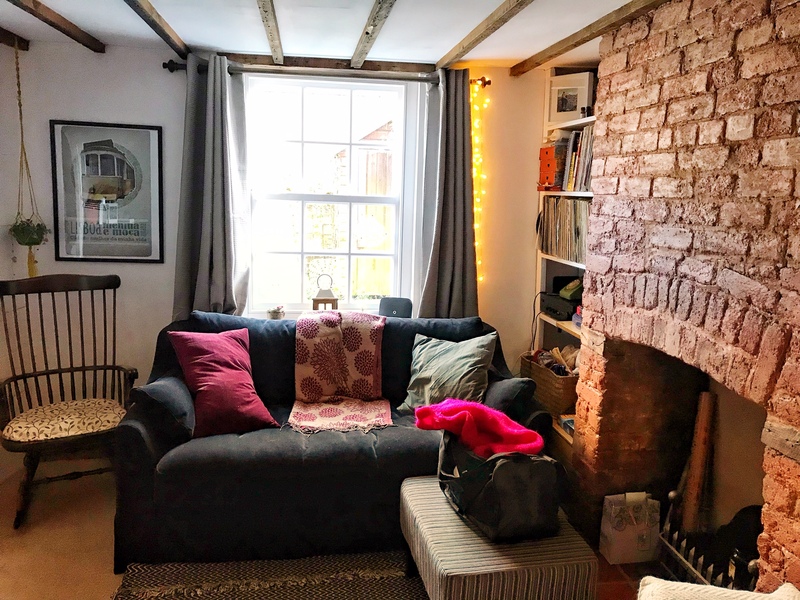 I write this blog to share the things I’m enjoying on my travels with my family and friends. Others are welcome to come along, but I feel a need to explain that I realize my blog is more personal than most, but that’s what’s intended. 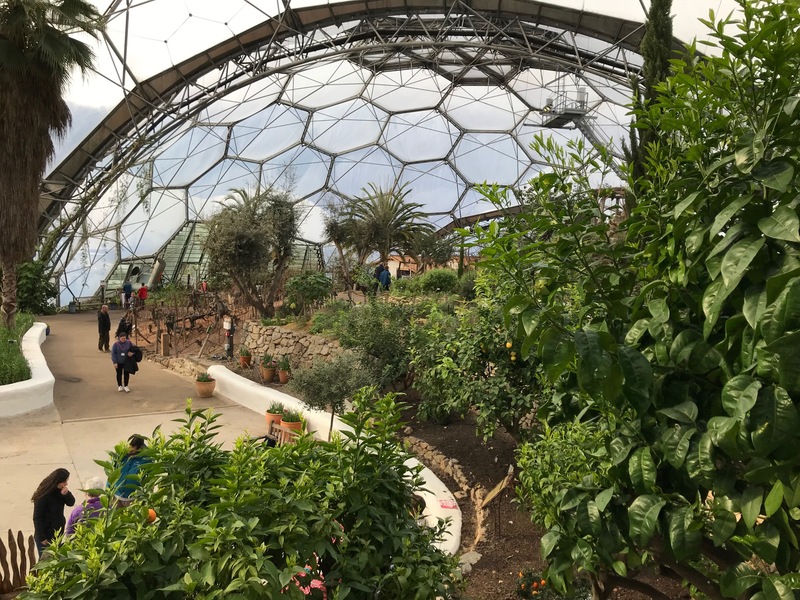 The Eden Project is an environmental education project housed in six enormous semi-transparent domes in Cornwall, England. Created in 1999, it has continued to inspire and educate children and adults for the past 20 years. I’ve wanted to go there for a long while and finally was able to do so recently. The leaders of this project can explain it much better than I can so I begin by asking you to view this 5-minute video to learn from one of the co-creators the history, the purpose and the aspirations of the project. 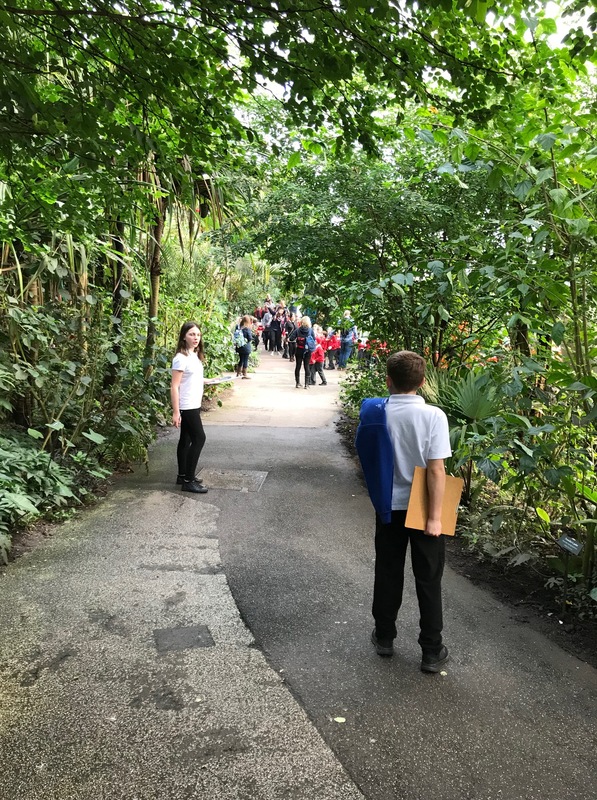 These school kids from France were in one of the three school groups at the Eden Project on the day I was there. Imagine walking through a Roman town that was hidden for 1700 years or so. Actually, we still walk on top of it because following its discovery, it had to be re-buried for safekeeping until money becomes available to permanently expose it. The Roman walls left from that time still surround the old city. 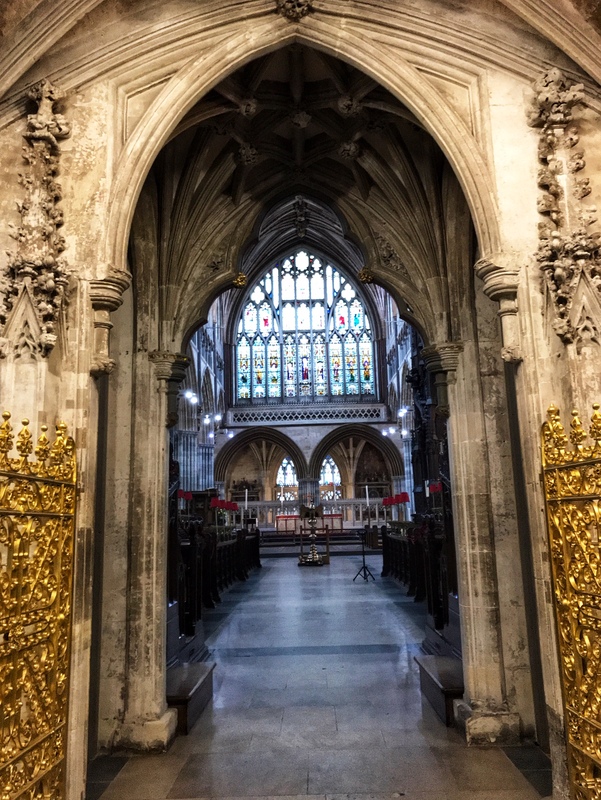 Imagine walking with a delightful guide through one of the most outstanding gothic cathedrals. Learning that this cathedral has the longest domed roof in the world. 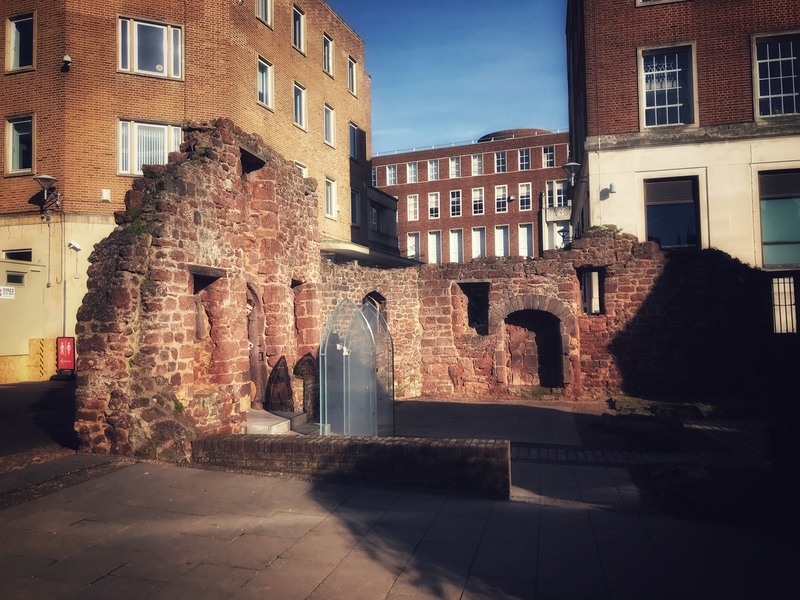 Learning where the bombs fell on the building when the town of Exeter was bombed in 1942 – and about the soccer game that paid for the restoration of the damage done. 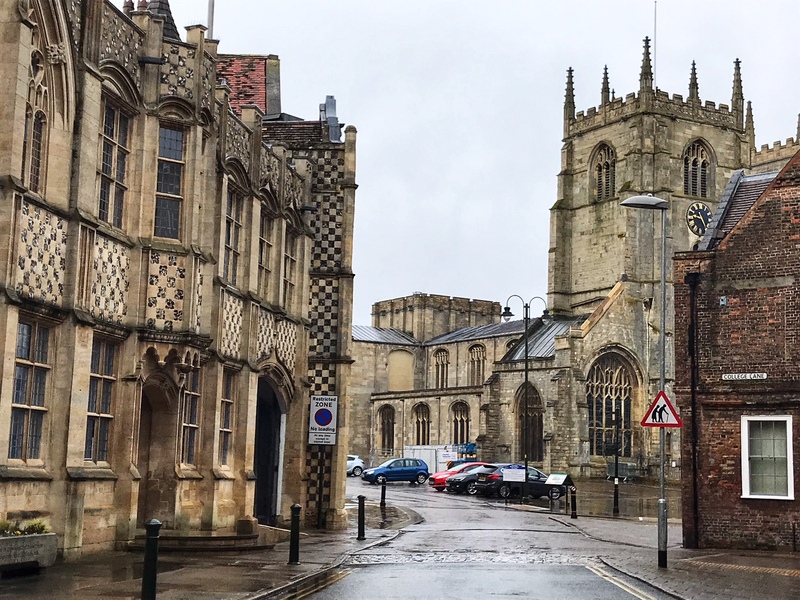 Imagine enjoying a delicious breakfast in a French bistro while admiring the ancient façade of the cathedral just a stone’s throw away. 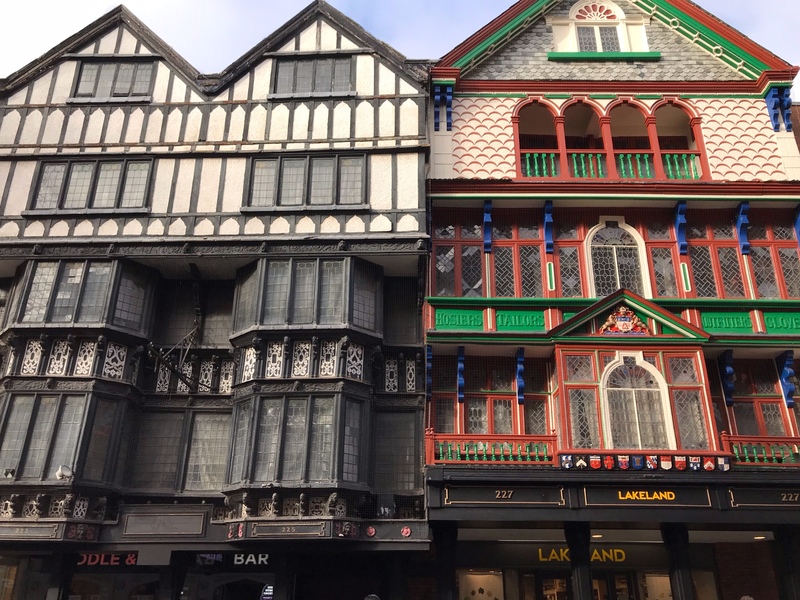 Imagine walking down the commercial street (almost always called “High Street” in England) past buildings that have been housing merchants’ stores since Victorian times or before. Today some of them are selling mobile phones and sporting goods and computers but others are doing what they’ve done for a very long time: vending high quality clothing in the latest styles. 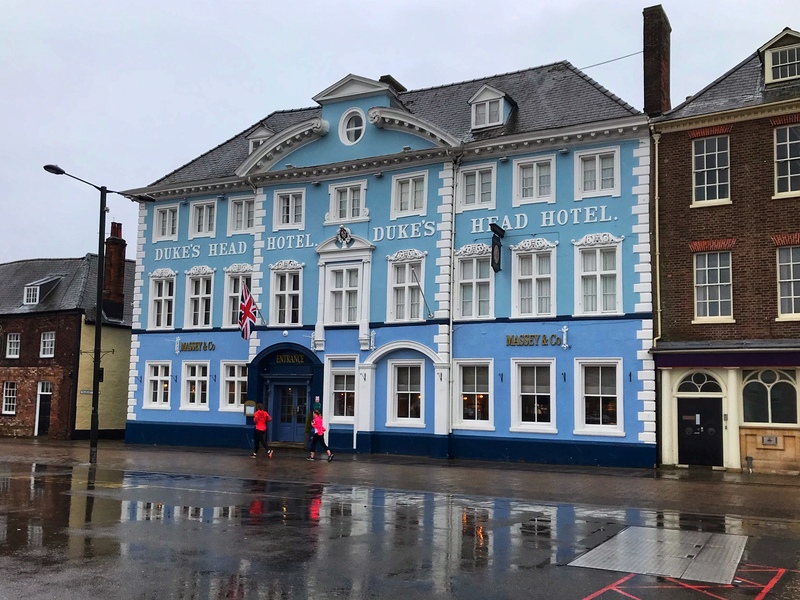 It’s always good to find Marks & Spencer and Debenhams on the shopping streets of British towns. 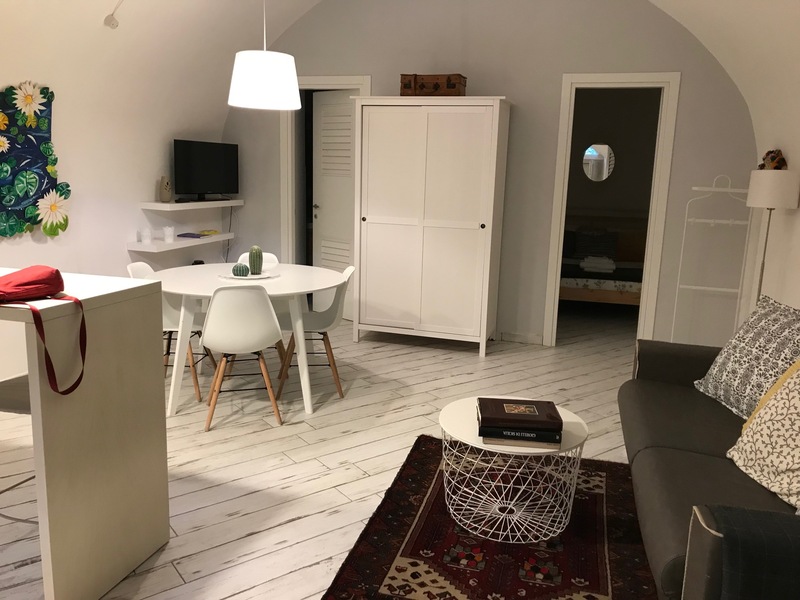 Imagine staying in a tiny cottage built in 1822, sleeping under a heavy down-filled duvet, enjoying for a few days the company and assistance of an AirBnB hostess. Truly, were it not for the existence of AirBnb and RyanAir, I could not be taking the trip that I’m now enjoying. I did all that on my first day in Exeter. For the next week I’ll be exploring counties Devon and Cornwall in southwest England. I plan to blog more often, showing you my discoveries. Please come again.